Indicate by check mark whether the registrant is a large accelerated filer, an accelerated filer, a non-accelerated filer or a smaller reporting company. See the definitions of “large accelerated filer”, “accelerated filer”, “smaller reporting company” and “emerging growth company” in Rule 12b-2 of the Exchange Act. The aggregate market value of the registrant’s voting common stock held by non-affiliates of the registrant, based on the last sales price of such stock on NASDAQ Global Select Market on June 30, 2017, the last business day of the registrant’s most recently completed second fiscal quarter: $295,236,168. Portions of the definitive proxy statement for the registrant’s May 23, 2018 annual meeting of shareholders, to be filed with the Securities and Exchange Commission no later than 120 days after December 31, 2017, are incorporated by reference in Part III. This Form 10-K contains some statements that are not historical facts. These statements are called “forward-looking statements” within the meaning of Section 27A of the Securities Act of 1933 and Section 21E of the Securities Exchange Act of 1934. These statements involve important known and unknown risks, uncertainties and other factors and can be identified by phrases using “estimate,” “anticipate,” “believe,” “project,” “expect,” “intend,” “predict,” “potential,” “future,” “may,” “will,” “should” and similar expressions or words. Our future results, performance or achievements may differ materially from the results, performance or achievements discussed in the forward-looking statements. These statements are not guarantees of future performance and involve certain risks, uncertainties and assumptions (“Risk Factors”) that are difficult to predict with regard to timing, extent, likelihood and degree of occurrence. Therefore, actual results and outcomes may materially differ from what may be expressed or forecasted in such forward-looking statements. Risk Factors include the risk factors listed and more fully described in Item 1A below, “Risk Factors”, as well as risk factors that we have discussed in previous public reports and other documents filed with the Securities and Exchange Commission. The list in Item 1A below includes all known risks our management believes could materially affect the results described by forward-looking statements contained in this Form 10-K. However, these risks may not be the only risks we face. Our business, operations, and financial performance could also be affected by additional factors that are not presently known to us or that we currently consider to be immaterial to our operations. In addition, new Risk Factors may emerge from time to time that may cause actual results to differ materially from those contained in any forward-looking statements. Given these risks and uncertainties, although we believe that the forward-looking statements contained in this Form 10-K are reasonable, we cannot provide you with any guarantee that the anticipated results will be achieved. All forward-looking statements in this Form 10-K are expressly qualified in their entirety by the cautionary statements contained in this section and investors should not place undue reliance on forward-looking statements as a prediction of actual results. The Company undertakes no obligation to update or revise any forward-looking statements to reflect developments or information obtained after the date this Form 10-K is filed with the Securities and Exchange Commission. When used in this Form 10-K, “Company”, “we”, “us” or “our” refers to Spartan Motors, Inc. and, depending on the context, could also be used to refer generally to the Company and its subsidiaries, which are described below. Spartan Motors, Inc. was organized as a Michigan corporation on September 18, 1975, and is headquartered in Charlotte, Michigan. Spartan Motors began development of its first product that same year and shipped its first fire truck chassis in October 1975. We are a niche market leader in the engineering and manufacturing of heavy-duty, purpose-built specialty vehicles. Our products include: walk-in vans and truck bodies used in e-commerce/parcel delivery; up-fit equipment used in the mobile retail, and utility trades; fire trucks and fire truck chassis; luxury Class A diesel motor home chassis; military vehicles; and contract manufacturing and assembly services. We also supply replacement parts and offer repair, maintenance, field service and refurbishment services for the vehicles that we manufacture. Our operating activities are conducted through our wholly-owned operating subsidiary, Spartan Motors USA, Inc. (“Spartan USA”), with locations in Charlotte, Michigan; Brandon, South Dakota; Ephrata, Pennsylvania; Bristol, Indiana; Snyder and Neligh, Nebraska; and Delevan, Wisconsin, along with contract manufacturing in Kansas City, Missouri and Saltillo, Mexico. We employed 2,327 people across all of our business units and corporate location as of January 31, 2018. Our vehicles, parts and services are sold to original equipment manufacturers (OEMs), dealers, commercial and individual end users, and municipalities and other governmental entities. In 2017 55.7% of our revenue was derived from original equipment manufacturers, dealers, and end users, while 44.3% was derived from municipalities and other governmental entities. Our product portfolio gives us access to multiple differentiated markets and corresponding customer bases which help to mitigate the impact of business cycles. In 2015 we began executing against an aggressive turnaround plan targeting a return to profitability within three years. 2017 marks the end of that turnaround phase with our ER business returning to profitability and the beginning of our growth phase. We will continue to work towards maximizing operational efficiency and profitability, and add in a new focus on growing our revenue and market share through a combination of organic growth, acquisitions and entry into new synergistic markets. As illustrated in the charts below, over the past five years our revenue has increased by $237.6 million, a compound annual growth rate (CAGR) of 10.8%, while net income and adjusted EBITDA have grown by $21.9 million and $22.4 million respectively. Please see the reconciliation of adjusted EBITDA to Net income attributable to Spartan Motors, Inc., below. Our diversification across several sectors provides numerous opportunities while reducing overall risk as the various markets we serve tend to have different cyclicality. We have an innovative team focused on building lasting relationships with our customers by designing and delivering market leading specialty vehicles, vehicle components, and services. Additionally, our business structure provides the agility to quickly respond to market needs, take advantage of strategic opportunities when they arise and correctly size and scale operations to ensure stability and growth. Our expansion of equipment up-fit services in our Fleet Vehicles and Services segment, the recent award of a $214 million order from the United States Postal Service, and the growing opportunities that we have capitalized on in last mile delivery as a result of the rapidly changing e-commerce market are excellent examples of our ability to generate growth and profitability by quickly fulfilling customer needs. We have the ability to carry out our long-term growth plan and obtain optimal financial flexibility by using a combination of cash generated from borrowings, borrowings under our credit facilities as well as internally or externally generated equity capital as sources of expansion capital. We manufacture fleet vehicles used in the e-commerce/last mile/parcel delivery, beverage and grocery delivery, mobile retail, and trades and construction industries through our Bristol, Indiana and, beginning in 2018, our Ephrata, Pennsylvania operations. Our fleet vehicles are marketed under the Utilimaster brand name, which serves a diverse customer base and also sells aftermarket parts and accessories for walk-in vans and other delivery vehicles. We also provide vocation-specific equipment up-fit services, which are marketed and sold under the Spartan Up-fit Services go-to-market brand, through our contract manufacturing operations at St. Louis, Missouri and Saltillo, Mexico. Our Fleet Vehicles and Services segment employed 898 associates at our Bristol, Indiana facility, as of January 31, 2018, of which 121 were contracted employees. We offer fleet vehicles in class 1 through 6, the largest range of product offerings among our competitors. In the years ended December 31, 2017, 2016 and 2015, interior equipment up-fitting and aftermarket parts sales represented 17.3%, 25.9% and 14.9% of the Fleet Vehicles and Services segment sales. Our “Solution Experts” employ a customer-centric approach by working with customers through a process of listening and learning, needs assessment, and design innovation through building and implementing solutions custom designed for our customers. Recent innovations implemented by our Solution Experts include innovative and cost saving solutions for the specialty service segment, utility industry, food and beverage delivery, and mobile retail industry, such as safe loading equipment, keyless entry systems, backup camera systems, and refrigeration solutions. Our teams can deliver product customization ranging from out-of-the-box to 100% custom solutions. Assembled on a “stripped” truck chassis supplied with engine and drive train components, but without a cab, our walk-in vans are used in the parcel delivery, mobile retail and construction trades industries and feature a durable and lightweight aluminum body with a highly modular cargo area accessible from the cab. Our walk-in vans offer low step-in height for easy entry and exit and the best driver visibility in the industry. Our truck bodies are installed on a chassis from a variety of manufacturers that is supplied with a finished cab and are the industry standard for heavy-duty commercial delivery. They feature a highly customizable cargo area for maximum versatility and are manufactured with anti-rust galvanized steel and aluminum. Available with cargo lengths from 10 to 28 feet and interior heights ranging from 72 to 108 inches. The Reach is a smaller, more nimble walk-in van offering up to 35% better fuel economy than traditional walk-in vans. Built on an Isuzu diesel chassis and available in lengths of 12 or 14 feet, the Reach offers a versatile cargo area with integrated logistics tracks allowing for a tailored up-fit through either pre-designed vocational or completely custom packages. Our cutaway truck bodies are installed on a chassis from a variety of manufacturers that is supplied with a finished cab and are the industry standard for medium-duty commercial delivery. The innovative cab can be designed to fit as many as five crew members and can be configured with a set-back walk-through bulkhead allowing access to the cargo area from the cab. Available with cargo lengths from 10 to 18 feet and interior heights ranging from 72 to 90 inches. A productive, efficient and ergonomically designed walk-in van designed to make large product/package deliveries easy, with lower entry/exit height and 3-point grab rails at side and rear doors. Economical to operate with a cost of ownership about half that of a traditional walk-in van. We install specialty interior and exterior up-fit equipment for walk-in vans, truck bodies and passenger vans for added safety, cargo handling efficiency and vocational functionality. We provide a full line of parts and accessories for our walk-in vans and truck bodies. We market our fleet vehicles, including walk-in vans, cutaway vans and truck bodies, under the Aeromaster®, Velocity, Ultimate, Trademaster®, Metromaster®, Utilivan®, Spartan Upfit Services and Reach brand names. We sell our fleet vehicles to leasing companies, national and fleet accounts (national accounts typically have 1,000+ vehicle fleets and fleet accounts typically have 100+ vehicle fleets), and through a network of independent truck dealers in the U.S. and Canada. In 2018 we will begin marketing our truck bodies direct to retail customers in select markets. We provide aftermarket support, including parts sales and field service, to all of our fleet vehicle customers through our Customer Service Department located in Bristol, Indiana, which maintains the only online parts resource among the major delivery vehicle manufacturers. Except in limited circumstances, we do not provide financing to dealers, fleet or national accounts. We also maintain multi-year supply agreements with certain key fleet customers in the parcel and linen/uniform rental industries. We apply the Spartan Production System of lean manufacturing and continuous improvement to all of our fleet vehicle operations in order to maximize efficiency and reduce costs. We manufacture walk-in vans and truck bodies at our Bristol, Indiana facility and, beginning in 2018, manufacture truck bodies at our Ephrata, Pennsylvania facility. We have dedicated facilities at Kansas City, Missouri and Saltillo, Mexico aligned with our OEM customers for the installation of up-fit equipment. Our walk-in vans and truck bodies are manufactured on non-automated assembly lines utilizing a combination of high- and low-skilled tradespeople and assemblers. Our up-fit facilities utilize teams of workers requiring minimal capital investment for efficient and timely installation of a variety of equipment. We are one of the top three fire truck apparatus and cab-chassis manufacturers in North America, with an emphasis on broad categorical coverage. We engineer and manufacture custom emergency response cabs and chassis and complete apparatus to customer specifications, for use by the fire industry throughout the United States and Canada. Our Emergency Response Vehicles segment consists of the emergency response cab-chassis and apparatus operations at our Charlotte, Michigan location and the Spartan apparatus operations at our Brandon, South Dakota; Snyder and Neligh, Nebraska; Ephrata, Pennsylvania; and Delevan, Wisconsin locations, along with our Spartan-Gimaex joint venture. The Emergency Response Vehicles segment has extensive engineering experience in creating custom vehicles that perform specialized tasks, and generally manufactures vehicles only upon receipt of confirmed purchase orders; thus, it does not have significant amounts of completed product inventory. As an emergency response vehicle producer, Spartan Motors believes it holds a unique position for continued growth due to its engineering reaction time, manufacturing expertise and flexibility. The Emergency Response Vehicles segment employed 953 associates as of January 31, 2018, 2 of which were contracted employees. We communicate with end users to continuously identify innovations and bring the latest technology, safety and functionality to our emergency response cab-chassis and apparatus customers. Over the past few years, we have introduced innovations on our emergency response chassis and apparatus such as: our Spartan Select and S-180 truck programs, designed to provide the custom apparatus that emergency response professionals need with unprecedented order-to-delivery cycle times as short as 180 days; our industry-leading Advanced Protection System, which includes side curtain airbags, crew protecting knee bags, outboard accident sensors, smart restraint systems, heavy duty windshield wipers for increased visibility in all weather conditions, and a 360 degree camera that gives around-the truck visibility; our Advanced Climate Control system, the most advanced HVAC system available in the industry; Mobile Gateway, which provides an extensive group of connectivity features - even if the communications infrastructure is compromised or down; heated roll down side glass; optimized engine tunnel; and a new fire truck cab interior configuration, which provides additional space and comfort in both the driver and officer positions, improved shoulder harness accessibility, increased interior volume and a 45% reduction in in-cab noise levels when traveling at 45 mph. Our emergency response chassis consist of the cab, frame and running gear to which the apparatus is fitted. We custom manufacture emergency response chassis to customer specifications through our Spartan USA subsidiary. These specifications vary based on such factors as application, terrain, street configuration and the nature of the community, state or country in which the fire truck will be utilized. We have three fire truck chassis models within this product line: the Gladiator; Metro Star; and Metro Star X. Our pumpers are custom manufactured to customer specifications on Spartan chassis and are available as side, top or rear mount utilizing stainless steel or aluminum bodies with highly customizable storage configurations. We engineer, manufacture and market aerial ladder components for fire trucks under the Spartan, Smeal and Ladder Tower brands. Our aerial products are produced through our Spartan USA operations in Snyder, Nebraska and Ephrata, Pennsylvania, which have developed a full line of aerial products. Our rescues are optimized to carry the crew and the right equipment. Custom designs and configurations, include walk-in and walk-around to deliver the ultimate accessibility and storage capacity. Our tankers feature a full-size pump with multiple valve options to fit individual departments’ needs, backed by a vast onboard water tank that can respond to structural operations and serve as a mobile water supply source. We provide a full line of parts and accessories which are distributed by our dealer channel, and available factory direct. Spartan and its go-to-market brands provide factory service and authorized service across a network of nearly 300 service centers in North America. In addition to routine maintenance, body, aerial, pump, drivetrain, and chassis repair, Spartan and its brands offer departments without the budget for new apparatus the opportunity to refurbish their existing unit or fleet. We market our custom emergency response cab-chassis and apparatus through a network of dealers throughout the U.S. and Canada, as well as select markets in South America and Asia, under the Spartan, Smeal, Ladder Tower and UST brands. Our dealer organizations establish close working relationships with municipal fire departments. These personal contacts focus on the quality of the group’s specialty products and allow us to keep customers updated on new and improved product lines and end users’ needs. We provide aftermarket support, including parts sales, directly through our refurbishment centers located throughout the United States and through our dealer network. In 2017 and consistent with prior years, we were one of the largest participants of the Fire Department Instructors Conference, the largest fire and safety industry trade show in North America. We also participate in other trade shows throughout the year. Trade shows provide the opportunity to display products and to meet directly with OEMs who purchase chassis, dealers who sell finished vehicles and fire departments that use the finished products. Engineers from our advanced product development team attend these trade shows, and along with communication with our dealer network, work to provide the innovation, functionality and quality that fire departments need. We apply the Spartan Production System of lean manufacturing and continuous improvement to bring world class efficiency, productivity and quality to our chassis and apparatus operations. We manufacture our emergency response cab-chassis and apparatus at our Charlotte, Michigan; Brandon, South Dakota; Snyder, Nebraska; and Ephrata Pennsylvania locations. Emergency response cab-chassis are manufactured at our Charlotte, Michigan facility, while our apparatus and aerial ladders are manufactured at our Brandon, South Dakota; Snyder, Nebraska; Delavan, Wisconsin; and Ephrata, Pennsylvania locations. We are able to match the manufacturing capabilities of our various locations with the demands of the specific products in order to maximize efficiency. Due to the custom nature of our products, our manufacturing processes utilize skilled workers working on non-automated assembly lines. Our chassis and apparatus are generally manufactured to customer specifications in response to orders received. We also manufacture a limited number of chassis and apparatus for use as demonstration vehicles or to be sold from stock. Our Specialty Chassis and Vehicles segment operates out of our Charlotte, Michigan facility where we engineer and manufacture luxury Class A diesel motor home chassis, manufacture our Reach walk-in van, provide contract assembly of defense vehicles and other specialty chassis, and distribute related aftermarket parts and accessories. Our specialty vehicle products are manufactured to customer specifications upon receipt of confirmed purchase orders. As a specialty chassis and vehicle manufacturer, we believe we hold a unique position for continued growth due to the high quality and performance of our products, our engineering reaction time, manufacturing expertise and flexibility, and the scalability of our operations. Our specialty vehicle products are generally sold through original equipment manufacturers in the case of chassis and vehicles and to dealer distributors or directly to consumers for aftermarket parts and accessories. The Specialty Chassis and Vehicles segment employed 461 associates (all in Charlotte, Michigan) as of January 31, 2018, of which 99 were contracted employees. We promote effective communication through trade shows and motor home rallies with a wide variety of motor home owners to identify needs and bring our customers the latest technology and highest quality in our motor home and specialty chassis. Over the past few years, we have introduced innovations on our motor home chassis, including: custom tuned suspensions, independent front suspension, and passive steer tag axle that greatly improve ride, handling and maneuverability; adaptive cruise control, collision mitigation, electronic stability control and lane departure warning to improve safety; and automatic air leveling that adds convenience and functionality to top line motor homes. We custom manufacture diesel chassis for luxury Class A motor homes to the individual specifications of our motor home OEM customers through our Spartan USA subsidiary. These specifications vary based on specific interior and exterior design specifications, power requirements, horsepower, and electrical needs of the motor home bodies to be attached to the Spartan chassis. Our motor home chassis feature diesel engines of 360 to 605 horsepower and are used in motor homes ranging from 37 to 45 feet. Our motor home chassis are separated into four models: the K1, K2, K3, and K4 series chassis. We provide final assembly services for Isuzu N-gas and F-series chassis for the North American market. These class 3 and class 5 chassis are utilized in a variety of final configurations for light duty freight hauling and industrial uses. We have a low-cost structure and a highly skilled team of assembly workers, which, along with a dedication to lean manufacturing and continuous improvement allow us to deliver superior value in contract manufacturing. We partner with a variety of OEM customers to provide chassis and complete vehicle assembly for military vehicles, drill rigs, shuttle bus chassis and other specialty chassis and vehicles. We provide a full line of parts and accessories for our motor home, defense and specialty chassis as well as maintenance and repair services for our motor home and specialty chassis. We sell our Class A diesel motor home chassis to OEM manufacturers for use in construction of premium motor homes. We actively participate in a variety of trade shows and motor home rallies that promote our products and aftermarket parts and services in addition to providing an opportunity to communicate with our end customers to showcase Spartan’s latest innovations and identify needs and opportunities for continuous improvement of our chassis. Our motor home chassis and specialty manufacturing operations benefit from the Spartan Production System of lean manufacturing and continuous improvement to bring efficiency and cost reduction throughout our Specialty Chassis and Vehicles segment. We manufacture motor home chassis, drill rigs, military vehicles and specialty bus chassis on non-automated assembly lines at our Charlotte, Michigan facility. We assemble Isuzu N-gas and F-series chassis on high-volume assembly lines at our Charlotte, Michigan location that utilize a variety of state of the art automation and testing equipment. On January 1, 2017, we acquired substantially all of the assets and certain liabilities of Smeal Fire Apparatus Co., Smeal Properties, Inc., Ladder Tower Co., and U.S. Tanker Co., resulting in the addition of $124.7 million of revenue in 2017. When used in this Annual Report on Form 10-K, “Smeal” refers to the assets, liabilities, and operations acquired from such entities. The assets acquired consist of the assets used by the former owners of Smeal in the operation of its business designing, manufacturing, and distributing emergency response vehicle bodies and aerial devices for the fire service industry. Smeal has operations in Snyder and Neligh, Nebraska; Delavan, Wisconsin; and Ephrata, Pennsylvania and is operated as part of our Emergency Response Vehicles segment. Our acquisition of Smeal resulted in the expansion of our product portfolio and, with the addition of the Smeal dealer network, an expansion of our geographic reach across 44 states and 13 Canadian provinces and territories. The acquisition strengthened our emergency response vehicle product line with the addition of market leading aerial designs and three manufacturing locations that will allow us to align our product portfolio with location specific manufacturing expertise to further increase efficiency and accelerate our Emergency Response Vehicles segment’s return to profitability. Our strategy is to accelerate our growth by expanding into additional products and markets through opportunistic, strategic acquisitions. We believe that we have the management expertise, balance sheet strength and capital availability to enable continued growth through both organic expansion and an aggressive acquisition strategy. The principal methods we use to build competitive advantages include short engineering reaction time, custom design capability, high product quality, superior customer service and quick delivery. We employ a solutions-based approach to offer specialized products tailored to customer needs across the spectrum of our products. We compete with companies that manufacture for similar markets, including some divisions of large diversified organizations that have total sales and financial resources exceeding ours. Our competition in the fleet vehicle market ranges from one large manufacturer in the walk-in van market to a number of smaller manufacturers in the truck body and equipment up-fit markets. Our direct competitors in the emergency vehicle apparatus market are principally larger manufacturers that compete throughout the North American market and often have a strong international presence. Certain competitors are vertically integrated and manufacture their own emergency response chassis and/or apparatus, although they generally do not sell their chassis to outside customers (other OEMs). Our competitors in the specialty vehicle market are principally large multi-product line manufacturers of specialty and heavy-duty vehicles. We are dedicated to establishing long-term and mutually beneficial relationships with our suppliers. Through these relationships, we benefit from new innovations, higher quality, reduced lead times, smoother/faster manufacturing ramp-up of new vehicle introductions and lower total costs of doing business. Our accelerating growth and company-wide supply chain management initiatives allow us to benefit from economies of scale and maximize to focus on a common vision. The single largest commodity directly utilized in production is aluminum, which we purchase under purchase agreements based on forecasted production requirements. To a lesser extent we are dependent upon suppliers of lumber, fiberglass and steel for our manufacturing. We have initiated long-term supplier agreements and are consolidating suppliers where beneficial to gain pricing advantages. There are several readily available sources for the majority of these raw materials. However, we are heavily dependent on specific component part products from a few single source vendors. We maintain a qualification, on-site inspection, assistance, and performance measurement system to control risks associated with reliance on suppliers. We normally do not carry inventories of such raw materials or components in excess of those reasonably required to meet production and shipping schedules. Material and component cost increases are passed on to our customers whenever possible. However, there can be no assurance that there will not be any supply issues over the long-term. In the assembly of our fleet vehicles, we use chassis supplied by third parties, and generally do not purchase these chassis for inventory. For this market, we typically accept shipment of truck chassis owned by dealers or end users, for the purpose of installing and/or manufacturing our specialized commercial vehicles on such chassis, but from time to time we do purchase chassis for use in fulfilling certain customer orders. Our success depends on our ability to innovate and add new products and features ahead of changing market demands and new regulatory requirements. Thus, we emphasize research and development and commit significant resources to develop and adapt new products and production techniques. Our engineering team of nearly 200 technical professionals is looking past “current practices” and “best practices” to deliver “next practices” for our customers and shareholders. Our engineering group is organized as a unified team serving one goal throughout the company, to deliver world class products and manufacturing processes regardless of product line or location, a concept that we refer to as “One Spartan Engineering”. The team balances the synergies of One Spartan Engineering with fully integrated teams dedicated to product line specialization. Results are accomplished with the appropriate blend of predictive analysis and physical property testing in our Research and Development facilities along with ride-and-drive analysis. Our efforts range from executing special orders for current production; to new production development for new functionality and product improvements; to exciting technologies that are new to the markets we serve, like vehicle electrification. Our engineering actions are driven by our firm commitment to safety, quality, delivery, and productivity. We spent $6.5 million, $6.8 million and $4.6 million on research and development in 2017, 2016 and 2015, respectively. We provide limited warranties against assembly and construction defects. These warranties generally provide for the replacement or repair of defective parts or workmanship for specified periods, ranging from one year to the life of the product, following the date of sale. With the use of validation testing, predictive analysis tools and engineering and design standards, we strive to continuously improve product quality and durability, and reduce our exposure to warranty claims. The end users also may receive limited warranties from suppliers of components that are incorporated into our chassis and vehicles. For more information concerning our product warranties, see Note 10, Commitments and Contingent Liabilities, of the Notes to Consolidated Financial Statements appearing in this Form 10-K.
We have 27 United States patents (provisional and regular), which include rights to the design and structure of chassis and certain peripheral equipment, and have 14 pending patent applications in the United States. The existing patents will expire on various dates from 2018 through 2033 and all are subject to payment of required maintenance fees. We also own 33 United States trademark and service mark registrations. The trademark and service mark registrations are generally renewable under applicable laws, subject to payment of required fees and the filing of affidavits of use. In addition, we have various international trademark registrations and pending applications. We believe our products are identified by our trademarks and that our trademarks are valuable assets to all of our business segments. We are not aware of any infringing uses or any prior claims of ownership of our trademarks that could materially affect our business. It is our policy to pursue registration of our primary marks whenever possible and to vigorously defend our patents, trademarks and other proprietary marks against infringement or other threats to the greatest extent practicable under applicable laws. Compliance with federal, state and local environmental laws and regulations has not had, nor is it expected to have, a material effect on our capital expenditures, earnings or competitive position. Spartan USA is a participant in Spartan-Gimaex Innovations, LLC (“Spartan-Gimaex”), a 50/50 joint venture with Gimaex Holding, Inc. that was formed to provide emergency response vehicles for the domestic and international markets. Spartan-Gimaex is reported as a consolidated subsidiary of Spartan Motors, Inc. In February 2015, Spartan USA and Gimaex Holding, Inc. mutually agreed to begin discussions regarding the dissolution of the joint venture. In June 2015, Spartan USA and Gimaex Holding, Inc. entered into court proceedings to determine the terms of the dissolution. In February 2017, by agreement of the parties, the court proceeding was dismissed with prejudice and the judge entered an order to this effect as the parties agreed to seek a dissolution plan on their own. No dissolution terms have been determined as of the date of this Form 10-K.
We employed 2,327 associates as of January 31, 2018, substantially all of which are full-time, including 222 contracted associates. Management considers its relations with associates to be positive. Our production processes at our non-unionized facilities employ a combination of high- and low-skilled tradespeople and assemblers involved in body, electrical, mechanical, paint, and assembly operations. We serve customers ranging from municipalities to OEMs to commercial customers and vehicle dealers throughout our product lines. Sales to our top 10 customers in 2017 accounted for 38.8% of our revenue. Sales to customers that individually exceeded 10% of our consolidated revenue for 2016 and 2015 are detailed in the chart below. In 2017 no customer individually exceeded 10% of our consolidated revenue. We do have other significant customers which, if the relationship changes significantly, could have a material adverse impact on our financial position and results of operations. We believe that we have developed strong relationships with our customers and continually work to develop new customers and markets. See related risk factors in Item 1A of this Form 10-K. Sales to customers outside the United States were $81.2 million, $31.7 million and $40.1 million for the years ended December 31, 2017, 2016 and 2015, respectively, or 11.5%, 5.4% and 7.3%, respectively, of sales for those years. All of our long-lived assets are located in the United States. Our order backlog by reportable segment is summarized in the following table (in thousands). The increase in Fleet Vehicles and Services backlog was driven by a $214.3 million contract received in September, 2017 to supply delivery vehicles, which will be fulfilled through 2019. The increase in our Emergency Response Vehicles backlog was driven by the Smeal acquisition, which added $84.4 million to our backlog at December 31, 2017. The increase in Specialty Chassis and Vehicles backlog was driven by an increase in orders for motor home chassis as a result of new model introductions in 2017. Although the backlog of unfilled orders is one of many indicators of market demand, several factors, such as changes in production rates, available capacity, new product introductions and competitive pricing actions, may affect actual sales. Accordingly, a comparison of backlog from period to period is not necessarily indicative of eventual actual shipments. This report contains adjusted EBITDA (earnings before interest, taxes, depreciation and amortization), which is a non-GAAP financial measure. This non-GAAP measure is calculated by excluding items that we believe to be infrequent or not indicative of our continuing operating performance. For the periods covered by this report such items include expenses associated with restructuring actions taken to improve the efficiency and profitability of certain of our manufacturing operations, expenses related to product recall campaigns, non-cash charges related to the impairment of assets, expenses related to a recent business acquisition, the impact of the step-up in inventory value associated with the recent business acquisition, and the impact of the business acquisition on the timing of chassis revenue recognition. We present the non-GAAP measure adjusted EBITDA because we consider them it be an important supplemental measure of our performance. The presentation of adjusted EBITDA enables investors to better understand our operations by removing items that we believe are not representative of our continuing operations and may distort our longer term operating trends. We believe this measure to be useful to improve the comparability of our results from period to period and with our competitors, as well as to show ongoing results from operations distinct from items that are infrequent or not indicative of our continuing operating performance. We believe that presenting this non-GAAP measure is useful to investors because it permits investors to view performance using the same tools that management uses to budget, make operating and strategic decisions, and evaluate our historical performance. We believe that the presentation of this non-GAAP measure, when considered together with the corresponding GAAP financial measures and the reconciliations to that measure, provides investors with additional understanding of the factors and trends affecting our business than could be obtained in the absence of this disclosure. The following table reconciles Net income attributable to Spartan Motors, Inc. to Adjusted EBITDA for the periods indicated. Net Income (loss) attributable to Spartan Motors, Inc.
Our Annual Reports on Form 10-K, Quarterly Reports on Form 10-Q, Current Reports on Form 8-K and other reports (and amendments thereto) filed or furnished pursuant to Section 13(a) of the Securities Exchange Act are available, free of charge, on our internet website (www.SpartanMotors.com) as soon as reasonably practicable after we electronically file or furnish such materials with the Securities and Exchange Commission. The public may read and copy materials that we file with the SEC at the SEC’s Public Reference Room at 100 F Street, NW, Washington, DC 20549. The public may obtain information on the operation of the Public Reference Room by calling the SEC at 1-800-SEC-0330. The SEC maintains an internet website (www.sec.gov) that contains reports, proxy and information statements, and other information regarding issuers that file electronically with the SEC. Our financial condition, results of operations and cash flows are subject to various risks, many of which are not exclusively within our control, that may cause actual performance to differ materially from historical or projected future performance. The risks described below are the risks known to us that we believe could materially affect our business, financial condition, results of operations, or cash flows. However, these risks may not be the only risks we face. Our business could also be affected by additional factors that are not presently known to us, factors we currently consider to be immaterial to our operations, or factors that emerge as new risks in the future. We depend on local and municipal governments for a substantial portion of our business. In 2017, local and municipal governments were the end customer for 42% of our revenue, including custom fire truck chassis, fire truck bodies, aerial ladders and other fire truck related apparatus. These markets are heavily impacted by municipal capital spending budgets, which may be impacted by fluctuating municipal tax revenues. These budgetary constraints may have a significant adverse effect on the overall fire and emergency vehicle market and/or cause a shift in the fire and emergency vehicle market away from highly customized products toward commercially produced vehicles. These changes could result in weakened demand for our products, which may have an adverse impact on our net sales, financial condition, profitability and/or cash flows. The integration of businesses or assets we have acquired or may acquire in the future involves challenges that could disrupt our business and harm our financial condition. As part of our growth strategy, we have pursued and expect we will continue to selectively pursue, acquisitions of businesses or assets in order to diversify, expand our capabilities, enter new markets, or increase our market share. Integrating any newly acquired business or assets can be expensive and can require a great deal of management time and other resources. If we are unable to successfully integrate the newly acquired businesses with our existing business, we may not realize the synergies we expect from the acquisition and our business and results of operations may be adversely impacted. Re-configuration or relocation of our production operations could negatively impact our earnings. We may, from time to time, re-configure our production lines or relocate production of products between buildings or locations or to new locations in order to maximize the efficient utilization of our existing production capacity or take advantage of opportunities to increase manufacturing efficiencies. Costs incurred to effect these re-configurations or re-locations may exceed our estimate, and efficiencies gained may be less than anticipated, each of which may have a negative impact on our results of operations and financial position. Disruptions within our dealer network could adversely affect our business. We rely, for certain of our products, on a network of independent dealers to market, deliver, provide training for, and service our products to and for customers. Our business is influenced by our ability to initiate and manage new and existing relationships with dealers. From time to time, we or an individual dealer may choose to terminate the relationship, or the dealership could face financial difficulty leading to failure or difficulty in transitioning to new ownership. In addition, our competitors could engage in a strategy to attempt to acquire or convert our dealers to carry their products. We do not believe our business is dependent on any single dealer, the loss of which would have a sustained material adverse effect upon our business. However, disruption of dealer coverage within a specific local market could have an adverse impact on our business within the affected market. The loss or termination of a significant number of dealers could cause difficulties in marketing and distributing our products and have an adverse effect on our business, operating results or financial condition. In the event that a dealer in a strategic market experiences financial difficulty, we may choose to provide financial support, such as extending credit, to a dealership, reducing the risk of disruption, but increasing our financial exposure. We may not be able to successfully implement and manage our growth strategy. Our growth strategy includes expanding existing market share through product innovation, continued expansion into industrial and global markets, and merger or acquisition related activities. We believe our future success depends in part on our research and development and engineering efforts, our ability to manufacture or source the products and customer acceptance of our products. As it relates to new markets, our success also depends on our ability to create and implement local supply chain, sales and distribution strategies to reach these markets. The potential inability to successfully implement and manage our growth strategy could adversely affect our business and our results of operations. The successful implementation of our growth strategy will depend, in part, on our ability to integrate operations with acquired companies. Our efforts to grow our business in emerging markets are subject to all of these risks plus additional, unique risks. In certain markets, the legal and political environment can be unstable and uncertain which could make it difficult for us to compete successfully and could expose us to liabilities. We also make investments in new business development initiatives which, like many startups, could have a relatively high failure rate. We limit our investments in these initiatives and establish governance procedures to contain the associated risks, but losses could result and may be material. Our growth strategy also may involve acquisitions, joint venture alliances and additional arrangements of distribution. We may not be able to enter into acquisitions or joint venture arrangements on acceptable terms, and we may not successfully integrate these activities into our operations. We also may not be successful in implementing new distribution channels, and changes could create discord in our existing channels of distribution. When we introduce new products, we may incur expenses that we did not anticipate, such as recall expenses, resulting in reduced earnings. The introduction of new products is critical to our future success. We have additional costs when we introduce new products, such as initial labor or purchasing inefficiencies, but we may also incur unexpected expenses. For example, we may experience unexpected engineering or design issues that will force a recall of a new product or increase production costs of the product above levels needed to ensure profitability. In addition, we may make business decisions that include offering incentives to stimulate the sales of products not adequately accepted by the market, or to stimulate sales of older or less marketable products. The costs resulting from these types of problems could be substantial and have a significant adverse effect on our earnings. Any negative change in our relationship with our major customers could have significant adverse effects on revenues and profits. Our financial success is directly related to the willingness of our customers to continue to purchase our products. Failure to fill customers’ orders in a timely manner or on the terms and conditions they may impose could harm our relationships with our customers. The importance of maintaining excellent relationships with our major customers may also give these customers leverage in our negotiations with them, including pricing and other supply terms, as well as post-sale disputes. This leverage may lead to increased costs to us or decreased margins. Furthermore, if any of our major customers experience a significant downturn in their business, or fail to remain committed to our products or brands, then these customers may reduce or discontinue purchases from us, which could have an adverse effect on our business, results of operations and financial condition. There were no customers that accounted for 10 percent or greater of consolidated sales in 2017. We depend on a small group of suppliers for some of our components, and the loss of any of these suppliers could affect our ability to obtain components at competitive prices, which would decrease our sales or earnings. Most chassis, emergency response vehicle, aerial ladder and specialty vehicle commodity components are readily available from a variety of sources. However, a few proprietary or specialty components are produced by a small group of suppliers. In addition, we generally do not purchase chassis for our delivery vehicles. Rather, we accept shipments of vehicle chassis owned by dealers or end-users for the purpose of installing and/or manufacturing our specialized truck bodies on such chassis. There are four primary sources for commercial chassis and we have established relationships with all major chassis manufacturers. Changes in our relationships with these suppliers, shortages, production delays or work stoppages by the employees of such suppliers could have a material adverse effect on our ability to timely manufacture our products and secure sales. If we cannot obtain an adequate supply of components or commercial chassis, this could result in a decrease in our sales and earnings. Disruption of our supply base could affect our ability to obtain component parts. We increasingly rely on component parts from global sources in order to manufacture our products. Disruption of this supply base due to international political events or natural disasters could affect our ability to obtain component parts at acceptable prices, or at all, and have a negative impact on our sales, results of operations and financial position. Changes to laws and regulations governing our business could have a material impact on our operations. Our manufactured products and the industries in which we operate are subject to extensive federal and state regulations. Changes to any of these regulations or the implementation of new regulations could significantly increase the costs of manufacturing, purchasing, operating or selling our products and could have a material adverse effect on our results of operations. Our failure to comply with present or future regulations could result in fines, potential civil and criminal liability, suspension of sales or production, or cessation of operations. Certain U.S. tax laws currently afford favorable tax treatment for the purchase and sale of recreational vehicles that are used as the equivalent of second homes. These laws and regulations have historically been amended frequently, and it is likely that further amendments and additional regulations will be applicable to us and our products in the future. Amendments to these laws and regulations and the implementation of new regulations could have a material adverse effect on our results of operations. Our operations are subject to a variety of federal and state environmental regulations relating to noise pollution and the use, generation, storage, treatment, emission and disposal of hazardous materials and wastes. Although we believe that we are currently in material compliance with applicable environmental regulations, our failure to comply with present or future regulations could result in fines, potential civil and criminal liability, suspension of production or operations, alterations to the manufacturing process, costly cleanup or capital expenditures. Our businesses are cyclical and this can lead to fluctuations in our operating results. Economic, legal and other factors could impact our customers’ ability to pay accounts receivable balances due from them. In the ordinary course of business, customers are granted terms related to the sale of goods and services delivered to them. These terms typically include a period of time between when the goods and services are tendered for delivery to the customer and when the customer needs to pay for these goods and services. The amounts due under these payment terms are listed as accounts receivable on our balance sheet. Prior to collection of these accounts receivable, our customers could encounter drops in sales, unexpected increases in expenses, or other factors which could impact their ability to continue as a going concern and which could affect the collectability of these amounts. Writing off uncollectible accounts receivable could have a material adverse effect on our earnings and cash flow as the Company has major customers with material accounts receivable balances at any given time. We rely on our information technology systems to effectively manage our business data, communications, supply chain, product engineering, manufacturing, accounting and other business processes. While we believe we have robust processes in place to protect our information technology systems, if these systems are damaged, cease to function properly or are subject to a cyber-security breach such as infection with viruses or intentional attacks aimed at theft or destruction of sensitive data, we may suffer an interruption in our ability to manage and operate the business, and our results of operations and financial condition may be adversely affected. Implementing a new enterprise resource planning system could interfere with our business or operations. We are in the process of implementing a new enterprise resource planning (ERP) system. The ERP system was implemented at our first location in 2017, with the remaining locations expected to be implemented throughout 2018 to 2020. This project requires significant investment of capital and human resources, the re-engineering of many processes of our business, and the attention of many associates and managers who would otherwise be focused on other aspects of our business. Should the system not be implemented successfully, we may incur impairment charges that could materially impact our financial results. If the system does not perform in a satisfactory manner once implementation is complete, our business and operations could be disrupted and our results of operations negatively affected, including our ability to report accurate and timely financial results. Global political conditions could have a negative effect on our business. Concerns regarding acts of terrorism, armed conflicts, natural disasters and budget shortfalls have created significant global economic and political uncertainties that may have material and adverse effects on consumer demand (particularly the specialty and motor home markets), shipping and transportation, the availability of manufacturing components, commodity prices and our ability to engage in overseas markets. Risks associated with international sales and contracts could have a negative effect on our business. In 2017, 2016 and 2015 we derived 11.5%, 5.4% and 7.3% of our revenue from sales to, or related to, end customers outside the United States. We expect that international sales will continue to account for a meaningful amount of our total revenue, especially in our emergency response vehicles segment. Accordingly, we face numerous risks associated with conducting international operations, any of which could negatively affect our financial performance, including changes in foreign country regulatory requirements, the strength of the U.S. dollar compared to foreign currencies, import/export restrictions, the imposition of foreign tariffs and other trade barriers and disruptions in the shipping of exported products. Additionally, as a U.S. corporation, we are subject to the Foreign Corrupt Practices Act, which may place us at a competitive disadvantage to foreign companies that are not subject to similar regulations. Fuel shortages, or higher prices for fuel, could have a negative effect on sales. Gasoline or diesel fuel is required for the operation of the specialty vehicles we manufacture. There can be no assurance that the supply of these petroleum products will continue uninterrupted, that rationing will not be imposed or that the price of or tax on these petroleum products will not significantly increase in the future. Increases in gasoline and diesel prices and speculation about potential fuel shortages have had an unfavorable effect on consumer demand for motor homes from time to time in the past and may continue to do so in the future. This, in turn, may have a material adverse effect on our sales volume. Increases in the price of oil also can result in significant increases in the price of many of the components in our products, which may have an adverse impact on margins or sales volumes. Our operating results may fluctuate significantly on a quarter-to-quarter basis. Our quarterly operating results depend on a variety of factors including the timing and volume of orders, the completion of product inspections and acceptance by our customers, and various restructuring initiatives that may be undertaken from time to time. In addition, our Fleet Vehicles and Services segment experiences seasonality whereby product shipments in the first and fourth quarters are generally lower than other quarters as a result of the busy holiday delivery operations experienced by some of its largest customers. Accordingly, our financial results may be subject to significant and/or unanticipated quarter-to-quarter fluctuations. We have a significant amount of goodwill, intangible assets and other long-lived assets. At least annually, we review goodwill and non-amortizing intangible assets for impairment. Identifiable intangible assets, goodwill and other long-lived assets are also reviewed for impairment whenever events or changes in circumstances indicate the carrying amount of an asset may not be recoverable from future cash flows. In 2016 and 2015 we recorded asset impairment charges totaling $0.4 and $2.2 million against an asset group related to certain locations of our Emergency Response Vehicles segment. If the operating performance at one or more of our reporting units fails to meet future forecasts, or if future cash flow estimates decline, we could be required, under current U.S. accounting rules, to record additional impairment charges for our goodwill, intangible assets or other long-lived assets. Any write-off of a material portion of such assets could negatively affect our results of operations or financial position. Our stock price has been and may continue to be volatile, which may result in losses to our shareholders. The market price of the Company’s common stock has been and may continue to be subject to wide fluctuations in response to, among other things, quarterly fluctuations in operating results, a failure to meet published estimates of or changes in earnings estimates by securities analysts, sales of common stock by existing holders, loss of key personnel, market conditions in our industries, shortages of key product inventory components and general economic conditions. If there is a rise in the frequency and size of product liability, warranty and other claims against us, including wrongful death claims, our business, results of operations and financial condition may be harmed. We are frequently subject, in the ordinary course of business, to litigation involving product liability and other claims, including wrongful death claims, related to personal injury and warranties. We partially self-insure our product liability claims and purchase excess product liability insurance in the commercial insurance market. We cannot be certain that our insurance coverage will be sufficient to cover all future claims against us. Any increase in the frequency and size of these claims, as compared to our experience in prior years, may cause the premiums that we are required to pay for such insurance to rise significantly. It may also increase the amounts we pay in punitive damages, which may not be covered by our insurance. In addition, a major product recall or increased levels of warranty claims could have a material adverse effect on our results of operations. In 2015 we entered into a settlement agreement with the National Highway Traffic Safety Administration (“NHTSA”) pertaining to our early warning and defect reporting. The terms of the agreement include certain performance obligations that, if not completed satisfactorily, could subject us to additional fines of up to $5 million. Increased costs, including costs of raw materials, component parts and labor costs, potentially impacted by changes in labor rates and practices, could reduce our operating income. Our results of operations may be significantly affected by the availability and pricing of manufacturing components and labor, as well as changes in labor rates and practices. Increases in costs of raw materials used in our products could affect the cost of our supply materials and components, as rising steel and aluminum prices have impacted the cost of certain of our manufacturing components. Although we attempt to mitigate the effect of any escalation in components and labor costs by negotiating with current or new suppliers and by increasing productivity or, where necessary, by increasing the sales prices of our products, we cannot be certain that we will be able to do so without it having an adverse impact on the competitiveness of our products and, therefore, our sales volume. If we cannot successfully offset increases in our manufacturing costs, this could have a material adverse impact on our margins, operating income and cash flows. Our profit margins may decrease if prices of purchased component parts or labor rates increase and we are unable to pass on those increases to our customers. Even if we were able to offset higher manufacturing costs by increasing the sales prices of our products, the realization of any such increases often lags behind the rise in manufacturing costs, especially in our operations, due in part to our commitment to give our customers and dealers price protection with respect to previously placed customer orders. The following table sets forth information concerning the properties we own or lease. We consider our properties to generally be in good condition, well maintained, and suitable and adequate to meet our business requirements for the foreseeable future. In 2017, our manufacturing plants, taken as a whole, operated moderately below capacity. At December 31, 2017, we were parties, both as plaintiff or defendant, to a number of lawsuits and claims arising out of the normal conduct of our businesses. Our management does not currently expect our financial position, future operating results or cash flows to be materially affected by the final outcome of these legal proceedings. Market For Registrant’s Common Equity, Related Stockholder Matters, and Issuer Purchases of Equity Securities. We paid dividends on our outstanding common shares in 2017, 2016 and 2015 as shown in the table below. No assurance, however, can be given that any future distributions will be made or, if made, as to the amounts or timing of any future distributions as such distributions are subject to earnings, financial condition, liquidity, capital requirements, and such other factors as our Board of Directors deems relevant. The number of shareholders of record of our common stock on February 23, 2018 was 333. See Item 12 below for information concerning our equity compensation plans. 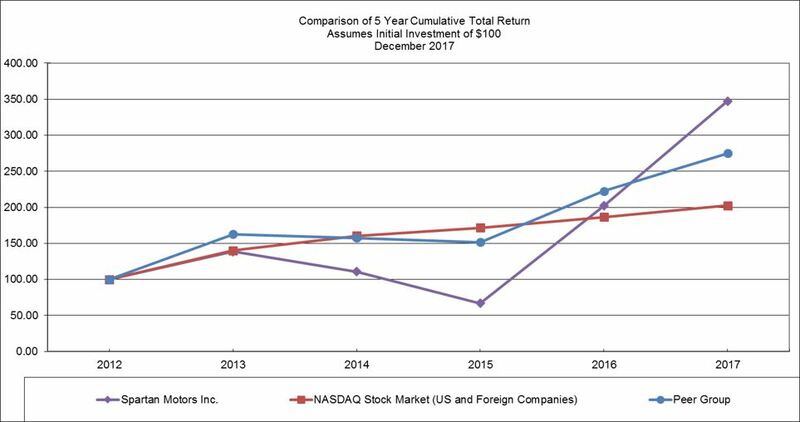 The following graph compares the cumulative total stockholder return on our common stock with the cumulative total return on the Nasdaq Composite Index and a company-selected peer group for the period beginning on December 31, 2012 and ending on the last day of 2017. The graph assumes an investment of $100 in our stock, the Nasdaq Composite Index, and the company-selected peer group on December 31, 2012, and further assumes the reinvestment of all dividends. Stock price performance, presented for the period from December 31, 2012 to December 31, 2017, is not necessarily indicative of future results. The company-selected peer group was determined based on a custom peer group of companies in the specialty manufacturing and automotive industries, against whom we compete for sales or management talent, which was identified for the purpose of benchmarking officer salaries in 2014. The peer group includes: LCI Industries, Inc. (formerly, Drew Industries, Inc.); Standard Motor Products, Inc.; Winnebago Industries, Inc.; Federal Signal Corp.; Methode Electronics, Inc.; Shiloh Industries, Inc.; Commercial Vehicle Group, Inc.; Altra Industrial Motion Corp.; Alamo Group, Inc.; ESCO Technologies, Inc.; Miller Industries, Inc.; and Twin Disc, Inc. The stock price performance graph and related information shall not be deemed “filed” with the Securities and Exchange Commission, nor shall such information be incorporated by reference by any general statement incorporating by reference this annual report on Form 10-K into any filing under the Securities Act of 1933 or the Securities Exchange Act of 1934, each as amended, except to the extent that we specifically incorporate this information by reference. On October 19, 2011, our Board of Directors authorized management to repurchase up to a total of 1.0 million shares of our common stock in open market transactions, contingent upon market conditions. During the second quarter of 2016, we repurchased a total of 422,000 shares of our common stock at an average price of $4.74 per share under this authorization. We did not repurchase any shares in 2015. On April 28, 2016, our Board of Directors terminated the 2011 repurchase authorization effective June 30, 2016, and authorized the repurchase of up to 1.0 million additional shares of our common stock in open market transactions. At December 31, 2017 there were 1.0 million shares remaining under this repurchase authorization. If we were to repurchase the remaining 1.0 million shares of stock under the repurchase program, it would cost us $15.2 million based on the closing price of our stock on February 23, 2018. We believe that we have sufficient resources to fund any potential stock buyback in which we may engage. The selected financial data shown below for each of the five years in the period ended December 31, 2017 has been derived from our Consolidated Financial Statements. The following data should be read in conjunction with the Consolidated Financial Statements and related Notes thereto and “Management’s Discussion and Analysis of Financial Condition and Results of Operations” included in this Form 10-K.
Net earnings (loss) attributable to Spartan Motors, Inc.
On January 1, 2017, we acquired Smeal. Smeal has been included in our consolidated results of operations starting on the acquisition date. See Note 2, “Acquisition Activities” in Item 8, “Financial Statements and Supplementary Data" in this Annual Report for further discussion. Beginning in 2015, certain engineering costs related to routine product changes that were formerly classified within Research and development have been classified within Cost of products sold to more consistently align the results of our individual business units. Expenses of $7,825 for 2014 and $7,837 for 2013 have been reclassified accordingly. Beginning in the second quarter of 2016, we adopted a new accounting pronouncement which requires net deferred tax assets and liabilities to be classified as non-current on the Consolidated Balance Sheets. We retrospectively adopted this standard, and accordingly our Net working capital and Total assets for prior periods are shown reflecting this change. We are a leading, niche market engineer and manufacturer in the heavy-duty, purpose-built specialty vehicles market. Our operating activities are conducted through our wholly-owned operating subsidiary, Spartan Motors USA, Inc. (“Spartan USA”), with locations in Charlotte, Michigan; Brandon, South Dakota; Ephrata, Pennsylvania; Snyder and Neligh, Nebraska; Delavan, Wisconsin; and Bristol, Indiana along with contract manufacturing in Kansas City, Missouri and Saltillo, Mexico. On January 1, 2017, Spartan USA acquired substantially all of the assets and certain liabilities of Smeal Fire Apparatus Co., Smeal Properties, Inc., Ladder Tower Co., and U.S. Tanker Co. When used in this Annual Report on Form 10-K, “Smeal” refers to the assets, liabilities, and operations acquired from such entities. The assets acquired consist of the assets used by the former owners of Smeal in the operation of its business designing, manufacturing, and distributing emergency response vehicle bodies and aerial devices for the fire service industry. Smeal has operations in Snyder and Neligh, Nebraska; Delavan, Wisconsin; and Ephrata, Pennsylvania and is operated as part of our Emergency Response Vehicles segment. Our Bristol, Indiana location manufactures vehicles used in the parcel delivery, mobile retail and trades and construction industries, and supplies related aftermarket parts and services under the Utilimaster brand name. Our Kansas City, Missouri and Saltillo, Mexico locations sell and install equipment used in fleet vehicles. Our Charlotte, Michigan location manufactures heavy duty chassis and vehicles and supplies aftermarket parts and accessories under the Spartan Chassis and Spartan brand names. Our Brandon, South Dakota; Snyder and Neligh, Nebraska; Delavan, Wisconsin; and Ephrata, Pennsylvania locations manufacture emergency response vehicles under the Spartan, Smeal, U.S. Tanker and Ladder Tower brand names. Spartan USA is also a participant in Spartan-Gimaex Innovations, LLC (“Spartan-Gimaex”), a 50/50 joint venture with Gimaex Holding, Inc. that was formed to provide emergency response vehicles for the domestic and international markets. Spartan-Gimaex is reported as a consolidated subsidiary of Spartan Motors, Inc. In February 2015, Spartan USA and Gimaex Holding, Inc. mutually agreed to begin discussions regarding the dissolution of the joint venture. In June 2015, Spartan USA and Gimaex Holding, Inc. entered into court proceedings to determine the terms of the dissolution. In February 2017, by agreement of the parties, the court proceeding was dismissed with prejudice and the judge entered an order to this effect as the parties agreed to seek a dissolution plan on their own. No dissolution terms have been determined as of the date of this Form 10-K.
Our business strategy is to further diversify product lines and develop innovative design, engineering and manufacturing expertise in order to be the best value producer of custom vehicle products. Our diversification across several sectors provides numerous opportunities while reducing overall risk. Additionally, our business model provides the agility to quickly respond to market needs, take advantage of strategic opportunities when they arise and correctly size operations to ensure stability and growth. We have an innovative team focused on building lasting relationships with our customers. This is accomplished by striving to deliver premium custom vehicles, vehicle components, and services. We believe we can best carry out our long-term business plan and obtain optimal financial flexibility by using a combination of borrowings under our credit facilities, as well as internally or externally generated equity capital, as sources of expansion capital. Revenue of $707.1 million in 2017, compared to $590.8 million in 2016. Gross Margin of 12.6% in 2017, compared to 12.3% in 2016. Operating expense of $73.1 million, or 10.3% of sales in 2017, compared to $63.9 million or 10.8% of sales in 2016. Operating income of $16.2 million in 2017, compared to $8.6 million in 2016. Income tax expense of $0.1 million in 2017, flat with 2016. Net income of $15.9 million in 2017, compared to $8.6 million in 2016. Earnings per share of $0.46 in 2017, compared to $0.25 in 2016. Operating cash flow of $22.0 million in 2017, compared to $23.3 million in 2016. Order backlog of $535.1 million at December 31, 2017, compared to $249.5 million at December 31, 2016. We continue to focus on growth by expanding our market share in existing markets, pursuing new commercial opportunities through our alliance with Isuzu and other manufacturers and pursuing strategic acquisitions that enable us to expand into existing or new markets as opportunities occur. Our diversified business model. We believe the major strength of our business model is market diversity and customization. Our Fleet Vehicles and Specialty Chassis and Vehicles segments serve mainly business and consumer markets, effectively diversifying our company and complementing our Emergency Response Vehicles segment, which primarily serves governmental entities. Additionally, the fleet vehicle market is an early-cycle industry, complementary to the late-cycle emergency response vehicle industry. We intend to continue to pursue additional areas that build on our core competencies in order to further diversify our business. Our acquisition of Smeal, completed in January 2017 which brings significant scale to our Emergency Response Vehicles segment, expands the geographic reach of our dealer network and adds complementary products to our existing emergency response product portfolio. Our expansion into the equipment up-fit market for vehicles used in the parcel delivery, trades and construction industries. This rapidly expanding market offers an opportunity to add value to current and new customers for our fleet vehicles and vehicles produced by other original equipment manufacturers. Our expanding geographical footprint. With the acquisition of Smeal we acquired new locations that will allow us to maximize manufacturing efficiency across product lines and geographical areas. Our Spartan Select and 180 truck programs, designed to provide the custom apparatus that emergency response professionals need with unprecedented order-to-delivery cycle times as short as 180 days. The introduction of the Velocity, a new delivery vehicle design that combines the productivity of a walk-in van for multi-stop deliveries with the superior fuel economy of the Ford Transit chassis. The expansion of our alliance with Isuzu to include the assembly of Isuzu’s new F-Series truck. This expanded relationship demonstrates Isuzu’s confidence in Spartan’s quality, people, flexibility and expertise and provides another positive example of our successful execution of our multi-year plan for improving performance. The strength of our balance sheet, which includes robust working capital, low debt and access to credit through our revolving line of credit. The following section provides a narrative discussion about our financial condition and results of operations. The comments that follow should be read in conjunction with our Consolidated Financial Statements and related Notes thereto appearing in Item 8 of this Form 10-K.
Consolidated sales for the year ended December 31, 2017 increased by $116.3 million, or 19.7% to $707.1 million from $590.8 million in 2016, driven by our acquisition of Smeal on January 1, 2017. Revenue in our Emergency Response Vehicles segment increased by $119.9 million, mainly due to our acquisition of Smeal. Revenue in our Fleet Vehicles and Services segment decreased by $27.3 million, mainly due to a reduction in equipment up-fit orders received in 2017, while revenue in our Specialty Chassis and Vehicles segment increased by $24.0 million driven by strong shipments of motor home chassis. These changes in revenue are discussed more fully in the discussion of our segments below. Cost of products sold increased by $99.7 million, or 19.2%, to $617.9 million for the year ended December 31, 2017 from $518.2 million in 2016, primarily due to increased sales volume in 2017 driven by our acquisition of Smeal on January 1, 2017. Gross profit increased by $16.7 million, or 23.0%, to $89.2 million in 2017 from $72.5 million in 2016. Savings from increased operational efficiency in 2017 contributed $13.8 million to the increase, while the Smeal acquisition and higher overall non-Smeal sales volume contributed $7.1 million and $3.0 million, respectively, to the increase. Lower recall and warranty related charges in 2017 contributed $5.4 million to the increase while pricing adjustments impacting 2017 sales contributed $1.5 million to the increase. These increases were partially offset by a reduction in gross profit of $14.1 million due to a less favorable overall product mix in 2017 compared to 2016. Gross margin increased by 30 basis points to 12.6% in 2017 from 12.3% in 2016. Operational efficiency added 170 basis points to gross margin in 2017, while reduction of recall and warranty expense added 70 basis points and pricing adjustments added 20 basis points. These increases were largely offset by a 200 basis point decrease due to the unfavorable product mix in 2017. Operating expenses for the year ended December 31, 2017 increased by $9.2 million, or 14.4%, to $73.1 million from $63.9 million in 2016. Research and development expense decreased by $0.3 million in 2017, due to lower engineering project spending, mainly related to our discontinuation from the bidding process for the USPS next generation vehicle. Selling, general and administrative expense increased by $9.3 million, to $65.5 million in 2017 from $56.2 million in 2016. $6.0 million of this increase was due our acquisition of Smeal on January 1, 2017, while $3.0 million was due to an increase in legal and professional fees, largely related to acquisition activities, and $0.3 million was due to an increase in information technology related spending. Restructuring charges recorded in 2017 were relatively flat with 2016, as we continued with various operational improvement projects. Income tax expense for the year ended December 31, 2017 was flat with the prior year at $0.1 million. Our effective tax rate in 2017 was 0.6%, compared to 1.1% in 2016. In 2017 higher income before taxes caused a $2.7 million increase to federal income taxes at the statutory rate as compared to 2016. This increase to current income tax expense was favorably offset by three items that had not occurred in 2016: a $1.0 million benefit from the write-off of the tax basis of stock owned by the Company in an inactive, wholly-owned subsidiary that had been deemed worthless; $0.5 million adjustment related to the domestic manufacturing deduction; and a $0.4 million credit from the adoption in 2017 of new accounting guidance regarding the treatment of tax windfalls caused by the vesting of certain stock compensation. The write-off of the worthless stock in the inactive subsidiary caused us to forfeit certain state credit and net operating loss carry-forwards recorded in our deferred tax assets at $3.0 million, which were written off to deferred income tax expense. These carry-forwards had been fully offset by a valuation allowance, which was consequently reduced by $3.0 million. During 2017 we had determined that it was more likely than not that the benefit from our deferred tax assets would be realizable, and recorded an additional $6.5 million reduction to our valuation allowance. Therefore, in 2017 we reduced our valuation allowance by $9.5 million in total, $6.6 million greater than the reduction recorded in 2016. Partially offsetting that reduction was a $3.0 million decrease to the deferred tax assets due to the reduction in the federal corporate income tax rate from 35% to 21%. This rate reduction was a component of the Tax Cuts and Jobs Act of 2017, enacted on December 22, 2017 and effective January 1, 2018. The re-measurement of our deferred tax assets to the new rate was recorded in accordance with current accounting guidance as deferred income tax expense. Net earnings for the year ended December 31, 2017 increased by $7.3 million, or 84.9%, to $15.9 million compared to $8.6 million in 2016. Driving this increase were the increase in gross profit of $16.7 million, which was partially offset by the $9.2 million increase in operating expenses as discussed above. Net loss attributable to non-controlling interest consists of the portion of the after-tax loss related to the Spartan-Gimaex joint venture that is attributable to our joint venture partner, and was immaterial for the years ended December 31, 2017 and 2016. Net Earnings Attributable to Spartan Motors, Inc.
Net earnings attributable to Spartan Motors, Inc. for the year ended December 31, 2017 increased by $7.3 million to $15.9 million compared to $8.6 million in 2016. Driving this increase were the increases in gross profit of $16.7 million, which was partially offset by the $9.2 million increase in operating expenses as discussed above. On a per share basis, net earnings increased by $0.21 to $0.46 per share in 2017 compared to $0.25 per share in 2016, due to the factors discussed above. Consolidated sales for the year ended December 31, 2016 increased by $40.4 million, or 7.3% to $590.8 million from $550.4 million in 2015, driven by a $50.7 million increase in our Fleet Vehicles and Services segment. This increase was partially offset by decreases of $10.2 million in our Emergency Response Vehicles segment and $0.1 million in our Specialty Chassis and Vehicles segment. These changes in revenue are discussed more fully in the discussion of our segments below. Cost of products sold increased by $14.9 million, or 3.0%, to $518.2 million for the year ended December 31, 2015 from $503.3 million in 2015, primarily due to increased sales volume in 2016. Gross profit increased by $25.4 million, or 53.9%, to $72.5 million in 2016 from $47.1 million in 2015. The increase was mainly due to the higher equipment up-fit and other specialty chassis sales in 2016. Also contributing to the increase was an approximately $4.0 million increase resulting from improved manufacturing performance in our Emergency Response Vehicles segment, along with reductions of $1.7 million in accruals for warranty and recalls, $0.7 million in asset impairment charges and $0.4 million in restructuring charges recorded in 2016 compared to 2015. In addition, we incurred $1.0 million of charges related to the wind-down of our Spartan-Gimaex joint venture in 2015 that did not recur in 2016. Gross margin increased by 370 basis points to 12.3% in 2016 from 8.6% in 2015, mainly driven by a more favorable product mix resulting from the increase in equipment up-fit and other specialty chassis sales in 2016. Operating expenses for the year ended December 31, 2016 increased by $4.3 million, or 7.2%, to $63.9 million from $59.6 million in 2015. Research and development expense increased by $2.2 million in 2016, with approximately equal amounts due to charges incurred for testing related to product recalls in our Emergency Response Vehicles segment, new vehicle development expenses incurred in our Fleet Vehicles and Services segment, and increased engineering management and administrative costs experienced in 2016. Selling, general and administrative expense increased by $3.5 million in 2016 compared to 2015. This increase was due to a $4.4 million increase in incentive compensation in 2016 based on company performance, along with $0.8 million of costs related to the Smeal acquisition that closed on January 1, 2017 and a $0.5 million increase in legal fees in 2016. These increases were partially offset by charges of $1.2 million for asset impairments and $1.0 million for a NHTSA penalty recorded in 2015 that did not recur in 2016. Restructuring charges recorded in 2016 were $1.4 million lower than those recorded in 2015 as the activities related to our Emergency Response Vehicles segment restructuring initiated in 2015 wound down. Income tax expense for the year ended December 31, 2016 decreased by $4.8 million to expense of $0.1 million compared to $4.9 million in 2015. Our effective tax rate in 2016 was 1.1% compared to (38.7)% in 2015. Our effective tax rate in 2016 was impacted by a $2.9 million reduction to our deferred tax asset valuation allowance as a result of the taxable income generated in 2016. Our effective tax rate in 2015 was heavily impacted by an increase in the valuation allowances for various deferred tax assets. During the year ended December 31, 2015, we recorded an increase to our deferred tax asset valuation allowance, representing the portion of our deferred tax assets, net of the deferred tax liabilities, that, based on an assessment of available positive and negative evidence, may not be realizable in future periods. During the year ended December 31, 2016, we reversed a portion of the deferred tax asset valuation allowance as a result of the taxable income we generated. Net earnings for the year ended December 31, 2016 increased by $26.1 million to income of $8.6 million compared to a loss of $17.5 million in 2015. Driving this increase were the increases in gross profit of $25.4 million and decrease of $4.8 million in taxes, which were offset by the $4.3 million increase in operating expenses as discussed above. Net loss attributable to non-controlling interest consists of the portion of the after-tax loss related to the Spartan-Gimaex joint venture that is attributable to our joint venture partner. Net loss attributable to non-controlling interest decreased by $0.5 million for the year ended December 31, 2016 compared to the year ended December 31, 2015 due to charges recorded in 2015 related to the wind-down of the joint venture that did not reoccur in 2016. Net earnings attributable to Spartan Motors, Inc. for the year ended December 31, 2016 increased by $25.6 million to income of $8.6 million compared to a loss of $17.0 million in 2015. On a per share basis, net earnings increased by $0.75 to income of $0.25 per share in 2016 compared to a loss of $0.50 per share in 2015, due to the factors discussed above. We identify our reportable segments based on our management structure and the financial data utilized by our chief operating decision makers to assess segment performance and allocate resources among our operating units. We have three reportable segments: Fleet Vehicles and Services, Emergency Response Vehicles and Specialty Chassis and Vehicles. As a result of a realignment of our operating segments completed during the second quarter of 2017, certain fleet vehicles are now manufactured by our Specialty Chassis and Vehicles segment and sold via intercompany transactions to our Fleet Vehicles and Services segment, which then sells the vehicles to the final customer. Segment results from prior periods are shown reflecting the estimated impact of this realignment as if it had been in place for those periods. As a result of a realignment of our operating segments completed during the second quarter of 2016, aftermarket parts and accessories related to emergency response vehicles, which were formerly reported under the Specialty Chassis and Vehicles segment, are now included in the Emergency Response Vehicles segment. Segment results from 2015 are shown reflecting the change. Beginning in 2017, we evaluate the performance of our reportable segments based on Adjusted EBITDA. Adjusted EBITDA is defined as earnings before interest, taxes, depreciation and amortization, as adjusted by other adjustments made in order to present comparable results from period to period. These adjustments include restructuring charges and items related to our acquisition of Smeal, such as expenses incurred to complete the acquisition, the impact of fair value adjustments to inventory acquired from Smeal, and the impact on the timing of the recognition of gross profit for our chassis that are utilized by our recently acquired Smeal operations. We exclude these items from earnings in our Adjusted EBITDA measure because we believe they will be incurred infrequently and/or are otherwise not indicative of a segment's regular, ongoing operating performance. For those reasons, Adjusted EBITDA is also used as a performance metric for our executive compensation program, as discussed in our proxy statement for our 2017 annual meeting of shareholders, which proxy statement was filed with the SEC on April 13, 2017. Our Fleet Vehicles and Services segment consists of our operations at our Bristol, Indiana location, and beginning in 2018 certain operations at our Ephrata, Pennsylvania location, along with our operations at our up-fit centers in Kansas City, Missouri and Saltillo, Mexico and focuses on designing and manufacturing walk-in vans for the parcel delivery, mobile retail, and trades and construction industries, and the production of commercial truck bodies, and distributes related aftermarket parts and accessories. Our Emergency Response Vehicles segment consists of the emergency response chassis operations at our Charlotte, Michigan location and our operations at our Brandon, South Dakota; Snyder and Neligh, Nebraska; Delavan, Wisconsin; and Ephrata, Pennsylvania locations, along with our Spartan-Gimaex joint venture. This segment engineers and manufactures emergency response chassis and apparatus. Our Specialty Chassis and Vehicles segment consists of our Charlotte, Michigan operations that engineer and manufacture motor home chassis, defense vehicles and other specialty chassis and distribute related aftermarket parts and assemblies. Appropriate expense amounts are allocated to the three reportable segments and are included in their reported operating income or loss. The accounting policies of the segments are the same as those described, or referred to, in Note 1 - General and Summary of Accounting Policies. Assets and related depreciation expense in the column labeled “Eliminations and other” pertain to capital assets maintained at the corporate level. Eliminations for inter-segment sales are shown in the column labeled “Eliminations and other”. Segment loss from operations in the “Eliminations and other” column contains corporate related expenses not allocable to the operating segments. Interest expense and Taxes on income are not included in the information utilized by the chief operating decision makers to assess segment performance and allocate resources, and accordingly, are excluded from the segment results presented below. For certain financial information related to each segment, see Note 16, Business Segments, of the Notes to Consolidated Financial Statements appearing in Item 8 of this Form 10-K. Sales in our Fleet Vehicles and Services segment decreased by $27.3 million, or 9.8%, to $251.1 million in 2017 from $278.4 million in 2016. $28.7 million of the decrease was due to lower equipment up-fit sales, driven by an order from 2016 that did not extend into 2017, partially offset by a more favorable mix of vehicle sales driven by a change in our truck body sales strategy. International sales accounted for 5.1% of revenue in our Fleet Vehicles and Services segment in 2017. Order backlog for our Fleet Vehicles and Services segment increased by $178.2 million, or 198.9%, to $267.7 million in 2017 compared to $89.5 million in 2016, mainly due to the award of a $214 million contract to supply truck bodies to the United States Postal Service we received in September, 2017 which was partially offset by an $35.9 million decrease in the backlog for other fleet vehicles. Sales in our Fleet Vehicles and Services segment increased by $50.7 million, or 22.3%, to $278.4 million in 2016 from $227.7 million in 2015. $37.3 million of the increase was due to higher aftermarket parts and accessories sales, driven by higher demand for equipment up-fit. $10.0 million was due to increased vehicle unit volume, while $3.4 million was due to a more favorable mix of vehicle sales driven by a change in our truck body sales strategy. International sales accounted for 1.9% of revenue in our Fleet Vehicles and Services segment in 2016. Adjusted EBITDA for our Fleet Vehicles and Services segment was $31.2 million for the year ended December 31, 2016, an increase of $13.6 million compared to $17.6 million for the year ended December 31, 2015, driven by an increase in parts and equipment up-fit sales in 2016. Order backlog for our Fleet Vehicles and Services segment decreased by $6.6 million, or 6.8%, to $89.5 million in 2016 compared to $96.1 million in 2015, driven by a $25.5 million decrease in equipment up-fit orders, which was partially offset by an $18.9 million increase in vehicle backlog. In January 2017, we received $37.0 million in new orders for our Fleet Vehicles and Services segment, a 21.9% increase from January 2016. Sales in our Emergency Response Vehicles segment increased by $119.9 million, or 65.5%, from 2016 to 2017 driven by the acquisition of Smeal in January of 2017, along with a $2.0 million increase due to pricing changes in 2017. These increases were partially offset by a $5.2 million decrease due to lower volume outside of the Smeal acquisition and a $1.6 million decrease due to the product mix sold in 2017. International sales accounted for 22.4% of revenue in our Emergency Response Vehicles segment in 2017. Adjusted EBITDA for our Emergency Response Vehicles segment was $3.2 million for the year ended December 31, 2017, an increase of $10.7 million compared to $(7.5) million for the year ended December 31, 2016. The acquisition of Smeal added $3.3 million while volume and operational productivity improvements added $3.5 million to the increase in adjusted EBITDA, respectively. Pricing changes impacting 2017 revenue added $2.0 million, while lower warranty related costs added $1.9 million to the increase in adjusted EBITDA. Order backlog for our Emergency Response Vehicles segment increased by $93.7 million or 67.0% to $233.6 million at December 31, 2017 compared to $139.9 million in 2016, driven by the acquisition of Smeal in January of 2017. Sales in our Emergency Response Vehicles segment decreased by $10.2 million, or 5.3%, from 2015 to 2016. A $23.2 million sales decrease due to lower unit volume was partially offset by a $13.0 million sales increase due to the product mix sold in 2016, which included fewer low content fire trucks. International sales accounted for 13.5% of revenue in our Emergency Response Vehicles segment in 2016. There were no significant changes in the pricing of the products in our Emergency Response Vehicles segment during 2016. Adjusted EBITDA for our Emergency Response Vehicles segment was $(7.5) million for the year ended December 31, 2016, an increase of $1.2 million compared to $(8.7) million for the year ended December 31, 2015, mainly due to reduced selling expense in 2016 resulting from headcount reductions. Order backlog for our Emergency Response Vehicles segment decreased by $16.4 million or 10.5% to $139.9 million at December 31, 2016 compared to $156.3 million in 2015, driven by a more selective bid process established in 2016 as part of our turnaround strategy. Sales in our Specialty Chassis and Vehicles segment increased by $24.0 million, to $158.8 million in 2017 compared to $134.8 million in 2016. Motor home chassis sales increased by $26.6 million due to higher unit volumes, which was partially offset by a $0.5 million decrease due to pricing that impacted 2017 sales. Other specialty vehicle sales decreased by $2.7 million, driven by defense sales in 2016 that did not recur in 2017. These increases were partially offset by a decrease of $0.2 million in aftermarket parts and accessories sales due to decreased unit volumes. Adjusted EBITDA for our Specialty Chassis and Vehicles segment was $14.1 million for the year ended December 31, 2017, an increase of $5.8 million compared to $8.3 million for the year ended December 31, 2016. Operational efficiencies in 2017 resulted in an increase of $4.0 million, while higher unit volume, mainly in motor home chassis, added $2.2 million to the increase in adjusted EBITDA. These increases were partially offset by a $0.5 million decrease due to pricing adjustments that impacted 2017. Order backlog for our Specialty Chassis and Vehicles segment increased by $13.8 million, or 69.0%, to $33.8 million at December 31, 2017 compared to $20.0 million at December 31, 2016. This increase was due to a $14.5 million increase in backlog for motor home chassis, which was partially offset by a $0.7 million decrease in aftermarket parts and accessories backlog in 2016. Sales in our Specialty Chassis and Vehicles segment increased by $2.3 million, to $134.8 million in 2016 compared to $132.5 million in 2015. Other specialty vehicles sales increased by $9.7 million due to increased unit volumes. This increase was partially offset by decreases in motor home chassis and aftermarket parts and accessories sales of $5.3 million and $2.1 million, respectively, driven by lower unit volumes in 2016. Adjusted EBITDA for our Specialty Chassis and Vehicles segment was $8.3 million for the year ended December 31, 2016, a decrease of $0.5 million compared to $8.8 million for the year ended December 31, 2016, mainly due to the decrease in marketing and branding expenses in 2016. Order backlog for our Specialty Chassis and Vehicles segment increased by $1.6 million, or 8.7%, to $20.0 million at December 31, 2016 compared to $18.4 million at December 31, 2015. This increase was due to a $6.3 million increase in backlog for motor home chassis and a $0.3 million increase in aftermarket parts and accessories backlog, which were partially offset by a decrease of $4.9 million in backlog for defense vehicles due to the fulfillment of defense orders on hand in 2016. Accounts receivable increased by $17.7 million, or 27.1%, to $83.1 million at December 31, 2017, compared to $65.4 million at December 31, 2016. $16.1 million of the increase was due to accounts receivable acquired through our acquisition of Smeal, with the remainder of the increase due to the timing of invoicing. Inventory increased by $18.8 million, or 31.9%, to $77.7 million at December 31, 2017 compared to $58.9 million at December 31, 2016 mainly due to the addition of Smeal inventory of $26.1 million at December 31, 2017, offset by a decrease of $7.3 million in our Emergency Response Vehicles segment due to a continued focus on inventory reduction actions. Property, plant and equipment, net increased by $2.1 million, or 4.0%, to $55.2 million at December 31, 2017 compared to $53.1 million at December 31, 2016 mainly due to the acquisition of Smeal during the year which resulted in assumption of $5.8 million along with additional purchases of $5.3 million during the year. These increases were offset by depreciation. Goodwill increased by $11.4 million, or 71.3%, to $27.4 million at December 31, 2017 compared to $16.0 million at December 31, 2016 due to the Smeal acquisition. Intangible assets increased by $3.0 million, or 46.9%, to $9.4 million at December 31, 2017 compared to $6.4 million at December 31, 2016 due to an increase of $3.9 million from trade-names and certain non-patented technology acquired from Smeal, partially offset by amortization during the period. Net deferred tax assets increased by $4.0 million or 121.2%, to $7.3 million at December 31, 2017 from $3.3 million at December 31, 2016 primarily as a result of three factors. A $9.5 million increase resulted from the reduction of our valuation allowance recorded during the year as it was deemed more likely than not that we would realize the benefit of the net deferred tax asset. This increase was offset by a $3.0 million decrease due to the forfeiture of certain state net operating loss and credit carry-forwards, and a $2.9 million reduction due to the new federal corporate income tax rate of 21% as legislated by the Tax Cuts and Jobs Act of 2017. Although the tax rate change is not effective until January 1, 2018, the enactment of the law in 2017 required us to revalue our net deferred tax asset from the 2017 statutory rate of 35% to the new 2018 statutory rate of 21%, in accordance with current accounting guidance. Accounts payable increased by $9.3 million, or 29.7%, to $40.6 million at December 31, 2017 from $31.3 million at December 31, 2016. $2.1 million of the increase was due to accounts payable assumed through our acquisition of Smeal, with the remainder of the increase due to the timing of payments. Accrued warranty decreased by $1.0 million, or 5.2%, to $18.3 million at December 31, 2017 from $19.3 million at December 31, 2016, due to payments for repairs made during the year of $13.8 million, offset by $7.5 million for accruals for warranties provided on vehicles produced during the year and additional accruals of $1.6 million for changes in existing warranties. In addition, we assumed $3.7 million in warranty obligations related to the acquisition of Smeal. Deposits from customers increased by $9.3 million or 57.8% to $25.4 million at December 31, 2017 compared to $16.1 million at December 31, 2016. The increase was due to prepayments of $13.4 million remaining at December 31, 2017 related to Smeal, partially offset by more prepayments being applied to invoices for fulfilled orders than were received during 2017 for new orders in our Emergency Response Vehicles segment. Other current liabilities and accrued expenses increased by $4.4 million, or 57.1%, to $12.1 million at December 31, 2017 from $7.7 million at December 31, 2016, with $2.4 million of the increase related to an increase in our accrued taxes, $1.8 million due to liabilities assumed through our acquisition of Smeal, and the remainder due to the timing of accruals for various expenses incurred but not yet invoiced. Other non-current liabilities increased by $2.7 million, or 108.0%, to $5.2 million at December 31, 2017 from $2.5 million at December 31, 2016 due to a $1.7 million vendor rebate pre-payment received in 2017 along with an $0.7 million increase in our supplemental executive retirement plan liabilities and a $0.3 million increase in other liabilities. Accounts receivable increased by $8.8 million, or 15.5%, to $65.4 million at December 31, 2016 from $56.6 million at December 31, 2015, with approximately equal parts of the increase due to increased sales late in the fourth quarter of 2016 compared to 2015 and the timing of payment receipts in late 2016 compared to late 2015. In January 2017, $7.4 million of our accounts receivable was forgiven as part of our acquisition of Smeal. Our receivable days sales outstanding decreased to 40 days sales at December 31, 2016 from 41 days at December 31, 2015 mainly due to increased sales compared to the previous year. Inventory decreased by $1.7 million, or 2.8%, to $58.9 million at December 31, 2016 from $60.6 million at December 31, 2015, mainly due to completion and shipment of units and continued focus on inventory reduction actions. Other current assets increased by $1.0 million, or 28.6%, to $4.5 million at December 31, 2016 from $3.5 million at December 31, 2015 mainly due to an increase in prepaid expenses during the period. Net deferred tax asset increased by $2.7 million or 450.0%, to $3.3 million at December 31, 2016 from $0.6 million at December 31, 2015 as a result of the change in our valuation allowance during the year. The remaining residual value of $3.3 million represents that portion of our deferred income tax assets that could generate future tax losses and be successfully carried back and offset against current year taxable income to recover taxes paid. Accounts payable increased by $4.0 million, or 14.7%, to $31.3 million at December 31, 2016 from $27.3 million at December 31, 2015, mainly due to increased sales volume which resulted in increased purchases to support production. Accrued warranty increased by $2.7 million, or 16.3%, to $19.3 million at December 31, 2016 from $16.6 million at December 31, 2015, due to $5.7 million of accruals for warranties provided on vehicles produced during the year and additional accruals of $4.0 million for various repair campaigns in 2016 and $3.3 million for changes in existing warranties, offset by $10.3 million of payments for repairs made during the year. Accrued compensation and related taxes increased by $4.5 million, or 51.7%, to $13.2 million at December 31, 2016 from $8.7 million at December 31, 2015, mainly due to an increase in incentive compensation accruals as a result of our financial performance during the year. Deposits from customers increased by $3.0 million, or 22.9%, to $16.1 million at December 31, 2016 from $13.1 million at December 31, 2015, due to more customers electing to make deposits on orders in 2016. We receive deposits on orders at the option of our customers. Consequently, the amount of deposits on hand will vary from time to time. Other current liabilities and accrued expenses increased by $1.1 million, or 16.7%, to $7.7 million at December 31, 2016 from $6.6 million at December 31, 2015 mainly due to the timing of accruals for various expenses incurred but not yet invoiced. During 2017, cash and cash equivalents increased by $1.5 million to a balance of $33.5 million as of December 31, 2017. These funds, in addition to cash generated from future operations and available credit facilities, are expected to be sufficient to finance our foreseeable liquidity and capital needs. We generated $22.0 million of cash from operating activities during the year ended December 31, 2017, a decrease of $1.3 million from $23.3 million of cash generated from operating activities in 2016. Cash flow from operating activities decreased from 2016 due to $3.5 million increase in cash paid for warranty claims and a $5.2 million increase in cash utilized in the fulfilment of customer orders. These decreases which were partially offset by a $5.7 million increase in net income net of non-cash charges in 2017 and $1.7 million increase in cash generated through changes in other working capital items, mainly compensation related accruals. We generated $23.3 million of cash from operating activities during the year ended December 31, 2016, an increase of $10.4 million from $12.9 million of cash generated from operating activities in 2015. Cash flow from operating activities increased from 2015 due to a $14.8 million increase in net income net of non-cash charges and credits in 2016, and $3.6 million of cash generated through changes in various working capital items, mainly compensation related accruals. These increases were partially offset by $8.0 million of cash utilized in the fulfilment of customer orders. In 2018 we expect to incur non-recurring cash outlays of $15 million to $16 million. This estimate includes approximately $5.6 million of cash investment to expand certain production facilities, $3.7 million related to information technology upgrades, along with expenditures of $1.7 million for the replacement and upgrade of machinery and equipment used in operations. We plan to fund these cash outlays with borrowings from our existing $100 million line of credit along with cash generated from our operations in 2018. We utilized $34.2 million in investing activities during the year ended December 31, 2017, a $20.8 million increase compared to the $13.4 million utilized during the year ended December 31, 2016. This increase is mainly the result of our acquisition of Smeal on January 1, 2017. We used $13.4 million of cash for investing activities during the year ended December 31, 2016, an increase of $8.7 million from the $4.7 million utilized in 2015, mainly for the construction of a new assembly plant in Charlotte, Michigan, along with the purchase of property, plant and equipment used in our operations. We generated $13.7 million of cash through financing activities during the year ended December 31, 2017, compared to $10.6 million utilized during the year ended December 31, 2016. This increase is mainly due to the financing of our acquisition of Smeal from our existing $100 million line of credit on January 1, 2017. We used $10.6 million in financing activities during the year ended December 31, 2016, a $6.6 million increase compared to the $4.0 million utilized during the year ended December 31, 2015. This increase was driven by of a $5 million payment on our outstanding debt and $2.0 million utilized to repurchase our common stock. On January 1, 2017, we completed the acquisition of substantially all of the assets and certain liabilities of Smeal pursuant to an Asset Purchase Agreement dated December 12, 2016. This acquisition brought significant scale to our Emergency Response Vehicles segment, expanded the geographic reach of our dealer network and added complementary products to our existing emergency response product portfolio. See Note 2, Acquisition Activities in the Notes to Consolidated Financial Statements appearing in Item 8 of this Form 10-K for more information on this acquisition. During the years ended December 31, 2017, 2016 and 2015, we incurred $1.3 million, $1.1 million and $2.9 million of restructuring charges. The restructuring charges were incurred in 2017 for a company-wide initiative to streamline operations and integrate our Smeal acquisition. In 2016 and 2015, restructuring charges were incurred within our Emergency Response Vehicles segment related to the relocation of our Ocala, Florida manufacturing operations to our Charlotte, Michigan and Brandon, South Dakota facilities, along with efforts undertaken to upgrade production processes at our Brandon, South Dakota and Ephrata, Pennsylvania locations. See Note 4, Restructuring Charges, in the Notes to Consolidated Financial Statements appearing in Item 8 of this Form 10-K for further information. Working capital increased from December 31, 2016 to December 31, 2017, driven by changes in accounts receivable, inventory, accounts payable, and deposits from customers as described above. Working capital decreased from December 31, 2015 to December 31, 2016, driven by changes in accounts receivable, inventory, accounts payable, accrued warranty, accrued compensation and related taxes, and deposits from customers as described above. In February 2015, Spartan USA and Gimaex Holding, Inc. mutually agreed to begin discussions regarding the dissolution of the Spartan-Gimaex joint venture. In June 2015, Spartan USA and Gimaex Holding, Inc. entered into court proceedings to determine the terms of the dissolution. In February 2017, by agreement of the parties, the court proceeding was dismissed with prejudice and the judge entered an order to this effect as the parties agreed to seek a dissolution plan on their own. No dissolution terms have been determined as of the date of this Form 10-K. In the fourth quarters of 2015 and 2014, we accrued charges totaling $1.0 million and $0.2 million to write down certain inventory items associated with this joint venture to their estimated fair values. Costs associated with the wind-down will be impacted by the final dissolution agreement. The costs we have accrued so far represent the low end of the range of the estimated total charges that we believe we may incur related to the wind-down. While we are unable to determine the final cost of the wind-down with certainty at this time, we may incur additional charges, depending on the final terms of the dissolution, and such charges could be material to our results. On December 1, 2017, we entered into a First Amendment to our Second Amended and Restated Credit Agreement (the "Credit Agreement") by and among us, certain of our subsidiaries, Wells Fargo Bank, National Association, as administrative agent ("Wells Fargo"), and the lenders party thereto consisting of Wells Fargo, JPMorgan Chase Bank, N.A. and PNC Bank (the "Lenders"). Under the Credit Agreement, we may borrow up to $100 million from the Lenders under a three-year unsecured revolving credit facility. We may also request an increase in the facility of up to $35 million in the aggregate, subject to customary conditions. The credit facility is available for the issuance of letters of credit of up to $20 million, swing line loans of up to $15 million and revolving loans, subject to certain limitations and restrictions. Interest rates on borrowings under the credit facility are based on either (i) the highest of the prime rate, the federal funds effective rate from time to time plus 0.5%, or the one month adjusted London interbank market rate ("LIBOR") plus 1.0%; or (ii) adjusted LIBOR plus a margin based upon our ratio of debt to earnings from time to time. The Credit Agreement contains certain customary representations and covenants, including performance-based financial covenants on our part. The credit facility matures October 31, 2019, following which we have the option to renew the credit facility, subject to lender approval, for two successive one-year periods with an ultimate maturity date of October 31, 2021. Commitment fees range from 17.5 to 32.5 basis points on the unused portion of the line. In January 2017, we borrowed $32.8 million from our credit line to fund our acquisition of Smeal. At December 31, 2017 we had outstanding borrowings of $17.8 million against our credit line. We had no drawings against this credit line as of December 31, 2016. During the year ended December 31, 2017, and in future years, our revolving credit facility was utilized, and will continue to be utilized, to finance commercial chassis received under chassis bailment inventory agreements with General Motors Company (“GM”) and Chrysler Group, LLC (“Chrysler”). This funding is reflected as a reduction of the revolving credit facility available to us equal to the amount drawn by GM and Chrysler. See Note 10, Commitments and Contingent Liabilities, in the Notes to Consolidated Financial Statements appearing in Item 8 of this Form 10-K for further details about these chassis bailment inventory agreements. The applicable borrowing rate including margin was 3.0% (or one-month LIBOR plus 1.5%) at December 31, 2017. Under the terms of our credit agreement with our banks, we have the ability to issue letters of credit totaling $20.0 million. At December 31, 2017 and 2016, we had outstanding letters of credit totaling $754 and $1,599 related to certain emergency response vehicle contracts and our workers compensation insurance. Under the terms of the primary line of credit agreement, as amended, we are required to maintain certain financial ratios and other financial conditions, which limited our available borrowings under our line of credit to a total of approximately $66.4 million and $73.6 million at December 31, 2017 and 2016. The agreements prohibit us from incurring additional indebtedness; limit certain acquisitions, investments, advances or loans; limit our ability to pay dividends in certain circumstances; and restrict substantial asset sales. At December 31, 2017, we were in compliance with all covenants in our credit agreement, and, based on our outlook for 2018, we expect to be able to meet these covenants over the next twelve months. We had capital lease obligations outstanding of $0.2 million and $0.1 million as of December 31, 2017 and 2016, due and payable over the next five years. On October 19, 2011, our Board of Directors authorized management to repurchase up to a total of 1.0 million shares of our common stock in open market transactions, contingent upon market conditions. During the second quarter of 2016, we repurchased a total of 422,000 shares of our common stock under this authorization. We did not repurchase any shares, under any repurchase authorizations, in 2017 or 2015. We have no off-balance sheet arrangements that have or are reasonably likely to have a material current or future effect on our financial condition, cash flows, results of operations, liquidity, capital expenditures or capital resources. Our future contractual obligations for agreements, including agreements to purchase materials in the normal course of business, are summarized below. The line of credit revolver includes estimated interest payments; interest payments on the related variable rate debt were calculated using the effective interest rate of 3.0% at December 31, 2017. Contingent payments are associated with the Smeal acquisition in January, 2017. The following discussion of critical accounting policies and estimates is intended to supplement Note 1, General and Summary of Accounting Policies, of the Notes to Consolidated Financial Statements appearing in Item 8 of this Form 10-K. These policies were selected because they are broadly applicable within our operating units and they involve additional management judgment due to the sensitivity of the methods, assumptions and estimates necessary in determining the related statement of income, asset and/or liability amounts. We recognize revenue in accordance with authoritative guidelines, including those of the Securities and Exchange Commission (“SEC”). Accordingly, revenue is recognized when title to the product and risk of ownership passes to the buyer. In certain instances, risk of ownership and title passes when the product has been completed in accordance with purchase order specifications and has been tendered for delivery to the customer. On certain customer requested bill and hold transactions, revenue recognition occurs after the customer has been notified that the products have been completed according to the customer specifications, have passed all of our quality control inspections, and are ready for delivery. All sales are shown net of returns, discounts and sales incentive programs, which historically have not been significant. The collectability of any related receivable is reasonably assured before revenue is recognized. We maintain an allowance for customer accounts that reduces receivables to amounts that are expected to be collected. In estimating the allowance for doubtful accounts, we make certain assumptions regarding the risk of uncollectable open receivable accounts. This risk factor is applied to the balance on accounts that are aged over 90 days: generally, this reserve has an estimated range from 10-25%. The risk percentage applied to the aged accounts may change based on conditions such as: general economic conditions, industry-specific economic conditions, historical and anticipated customer performance, historical experience with write-offs and the level of past-due amounts from year to year. However, generally our assumptions are consistent year-over-year and there has been little adjustment made to the percentages used. In addition, in the event there are certain known risk factors with an open account, we may increase the allowance to include estimated losses on such “specific” account balances. The “specific” reserves are identified by a periodic review of the aged accounts receivable. If there is an account in question, credit checks are made and there is communication with the customer, along with other means to try to assess if a specific reserve is required. The inclusion of the “specific” reserve has caused the greatest fluctuation in our allowance for doubtful accounts balance historically. Please see Note 1, General and Summary of Accounting Policies, in the Notes to Consolidated Financial Statements appearing in Item 8 of this Form 10-K and Appendix A included in this Form 10-K for further details and historical view of our allowance for doubtful accounts balance. In accordance with authoritative guidance on goodwill and other indefinite-lived intangible assets, such assets are tested for impairment at least annually, and written down when and to the extent impaired. We perform our annual impairment test for goodwill and indefinite-lived intangible assets as of October 1 of each year, or more frequently if an event occurs or conditions change that would more likely than not reduce the fair value of the asset below its carrying value. At December 31, 2017, we had recorded goodwill at our Fleet Vehicles and Services, Emergency Response Vehicles and Specialty Chassis and Vehicles reportable segments. The Fleet Vehicles and Services and Emergency Response Vehicles reportable segments were determined to be reporting units for goodwill impairment testing, while the reporting unit for the goodwill recorded in the Specialty Chassis and Vehicles segment was determined to be limited to the Reach Manufacturing component of that reportable segment. The goodwill recorded in these reporting units was evaluated for impairment as of October 1, 2017 using a discounted cash flow valuation. At December 31, 2016, we had recorded goodwill at our Fleet Vehicles and Services reportable segment, which was also determined to be a reporting unit for goodwill impairment testing. The goodwill recorded in the Fleet Vehicles and Services reporting unit was evaluated for impairment as of October 1, 2016 using a discounted cash flow valuation. We first assess qualitative factors including, but not limited to, macroeconomic conditions, industry conditions, the competitive environment, changes in the market for our products and current and forecasted financial performance to determine whether it is more likely than not that the fair value of a reporting unit is less than its carrying amount. If we determine that it is more likely than not that the fair value of the reporting unit is greater than its carrying amount, we are not required to calculate the fair value of a reporting unit. We have the option to bypass this qualitative assessment and proceed to a quantitative goodwill impairment assessment. If we elect to bypass the qualitative assessment, or if after completing the assessment it is determined to be more likely than not that the fair value of a reporting unit is less than its carrying value, we perform an impairment test by comparing the fair value of a reporting unit with its carrying amount, including goodwill. The fair value of the reporting unit is determined by estimating the future cash flows of the reporting unit to which the goodwill relates, and then discounting the future cash flows at a market-participant-derived weighted-average cost of capital (“WACC”). In determining the estimated future cash flows, we consider current and projected future levels of income based on our plans for that business; business trends, prospects and market and economic conditions; and market-participant considerations. If the fair value of a reporting unit exceeds its carrying amount, goodwill of the reporting unit is considered to not be impaired. If the carrying amount of the reporting unit exceeds its fair value, an impairment loss is recognized in an amount equal to the excess, up to the value of the goodwill. We evaluate the recoverability of our indefinite lived intangible assets, which, as of December 31, 2017, consisted of our Utilimaster and Smeal trade names, by comparing the estimated fair value of the trade names with their carrying values. We estimate the fair value of our trade names based on estimates of future royalty payments that are avoided through our ownership of the trade name, discounted to their present value. In determining the estimated fair value of the trade names, we consider current and projected future levels of revenue based on our plans for Utilimaster and Smeal branded products, business trends, prospects and market and economic conditions. Significant judgments inherent in these analyses include assumptions about appropriate sales growth rates, WACC and the amount of expected future net cash flows. The judgments and assumptions used in the estimate of fair value are generally consistent with the projections and assumptions that are used in current operating plans. Such assumptions are subject to change as a result of changing economic and competitive conditions. The determination of fair value is highly sensitive to differences between estimated and actual cash flows and changes in the related discount rate used to evaluate the fair value of the reporting units and trade name. In 2017, we elected to bypass the qualitative assessment and proceed to the quantitative goodwill impairment assessment for all of our reporting units. The estimated fair values of these reporting units exceeded their carrying values by 232%, 91% and 62%, respectively, as of October 1, 2017, the most recent annual assessment date. Based on the discounted cash flow valuations at October 1, 2017, an increase in the WACC for the reporting units of 500 basis points would not result in impairment. The acquired Utilimaster and Smeal trade names have indefinite lives as it is anticipated that they will contribute to our cash flows indefinitely. The estimated fair values of our Utilimaster and Smeal trade names exceeded their associated carrying values of $2.9 million and $2.4 million, respectively, by 545% and 141%, respectively, as of October 1, 2017. Accordingly, there was no impairment recorded on these trade names. Based on the discounted cash flow valuations at October 1, 2017, an increase in the WACC used for these impairment analyses of 500 basis points would not result in impairment in the trade names. At December 31, 2014, our indefinite lived intangible assets included the Classic Fire trade name. During the quarter ended September 30, 2015, we determined that, based on updated sales forecasts for our Classic line of emergency response vehicles, it was more likely than not that our Classic Fire trade name intangible asset was impaired. Accordingly, we conducted an impairment test by comparing the discounted future cash flows expected to result from our ownership of the trade name with its carrying cost at September 30, 2015. The result of this analysis showed that the carrying cost of the Classic Fire trade name, which was recorded as an asset of our Emergency Response Vehicles segment exceeded its fair value. Accordingly, an impairment charge of $0.6 million was recorded during the three months ended September 30, 2015 to reduce the carrying cost of the trade name to its estimated fair value. See Note 5, Goodwill and Intangible Assets, in the Notes to Consolidated Financial Statements appearing in Item 8 of this Form 10-K for further details on our goodwill and indefinite-lived intangible assets. We cannot predict the occurrence of certain events or changes in circumstances that might adversely affect the carrying value of goodwill and indefinite-lived intangible assets. Such events may include, but are not limited to, the impact of the general economic environment; a material negative change in relationships with significant customers; or strategic decisions made in response to economic and competitive conditions; and other risk factors as detailed in Item 1A “Risk Factors” in this Annual Report on Form 10-K.
Our policy is to record a provision for the estimated cost of warranty-related claims at the time of the sale, and periodically adjust the warranty liability to reflect actual experience. The amount of warranty liability accrued reflects actual historical warranty cost, which is accumulated on specific identifiable units. From that point, there is a projection of the expected future cost of honoring our obligations under the warranty agreements. Historically, the cost of fulfilling our warranty obligations has principally involved replacement parts and labor for field retrofit campaigns and recalls, which increase the reserve. Our estimates are based on historical experience, the number of units involved and the extent of features and components included in product models. See Note 10, Commitments and Contingent Liabilities, in the Notes to Consolidated Financial Statements appearing in Item 8 of this Form 10-K for further information regarding warranties. We account for income taxes under a method that requires deferred income tax assets and liabilities to be recognized using enacted tax rates for the effect of temporary differences between the book and tax bases of recorded assets and liabilities. Authoritative guidance also requires deferred income tax assets, which include state tax credit carryforwards, operating loss carryforwards and deductible temporary differences, be reduced by a valuation allowance if it is more likely than not that some portion or all of the deferred income tax assets will not be realized. We evaluate the likelihood of realizing our deferred income tax assets by assessing our valuation allowance and by adjusting the amount of such allowance, if necessary. The factors used to assess the likelihood of realization include our forecast of future taxable income, the projected reversal of temporary differences and available tax planning strategies that could be implemented to realize the net deferred income tax assets. We recognize the tax benefit from an uncertain tax position only if it is more likely than not that the tax position will be sustained on examination by the taxing authorities. The determination is based on the technical merits of the position and presumes that each uncertain tax position will be examined by the relevant taxing authority that has full knowledge of all relevant information. Although management believes the estimates are reasonable, no assurance can be given that the final outcome of these matters will not be different than what is reflected in the historical income tax provisions and accruals. Interest and penalties attributable to income taxes are recorded as a component of income taxes. See Note 1, General and Summary of Accounting Policies, in the Notes to Consolidated Financial Statements appearing in Item 8 of this Form 10-K.
Inflation affects us in two principal ways. First, our revolving credit agreement is generally tied to the prime and LIBOR interest rates so that increases in those interest rates would be translated into additional interest expense. Second, general inflation impacts prices paid for labor, parts and supplies. Whenever possible, we attempt to cover increased costs of production and capital by adjusting the prices of our products. However, we generally do not attempt to negotiate inflation-based price adjustment provisions into our contracts. Since order lead times can be as much as nine months, we have limited ability to pass on cost increases to our customers on a short-term basis. In addition, the markets we serve are competitive in nature, and competition limits our ability to pass through cost increases in many cases. We strive to minimize the effect of inflation through cost reductions and improved productivity. Our primary market risk exposure is a change in interest rates and the effect of such a change on outstanding variable rate short-term and long-term debt. At December 31, 2017, we had $17.8 million in debt outstanding under our variable rate short-term and long-term debt agreements. An increase of 100 basis points in interest rates would result in additional interest expense of $0.2 million on an annualized basis for the floating rate debt that we incurred in January 2017 for the acquisition of Smeal. We believe that we have sufficient financial resources to accommodate this hypothetical increase in interest rates. We do not enter into market-risk-sensitive instruments for trading or other purposes. We do not believe that there has been a material change in the nature or categories of the primary market risk exposures or in the particular markets that present our primary risk of loss. As of the date of this report, we do not know of or expect any material changes in the general nature of our primary market risk exposure in the near term. In this discussion, “near term” means a period of one year following the date of the most recent balance sheet contained in this report. Prevailing interest rates and interest rate relationships are primarily determined by market factors that are beyond our control. All information provided in response to this item consists of forward-looking statements. Reference is made to the section captioned “Forward-Looking Statements” before Part I of this Annual Report on Form 10-K for a discussion of the limitations on our responsibility for such statements. We have audited the accompanying consolidated balance sheets of Spartan Motors, Inc. (the “Company”) and subsidiaries as of December 31, 2017 and 2016, the related consolidated statements of operations, shareholders’ equity, and cash flows for each of the three years in the period ended December 31, 2017, and the related notes and financial statement schedule as listed in the accompanying index in Item 15(a)(2) of this Form 10-K (collectively referred to as the “consolidated financial statements”). In our opinion, the consolidated financial statements present fairly, in all material respects, the financial position of the Company and subsidiaries at December 31, 2017 and 2016, and the results of their operations and their cash flows for each of the three years in the period ended December 31, 2017, in conformity with accounting principles generally accepted in the United States of America. We also have audited, in accordance with the standards of the Public Company Accounting Oversight Board (United States) (“PCAOB”), the Company's internal control over financial reporting as of December 31, 2017, based on criteria established in Internal Control – Integrated Framework (2013) issued by the Committee of Sponsoring Organizations of the Treadway Commission (“COSO”) and our report dated March 1, 2018 expressed an unqualified opinion thereon. We have audited Spartan Motors, Inc.’s (the “Company’s”) internal control over financial reporting as of December 31, 2017, based on criteria established in Internal Control – Integrated Framework (2013) issued by the Committee of Sponsoring Organizations of the Treadway Commission (the “COSO criteria”). In our opinion, the Company maintained, in all material respects, effective internal control over financial reporting as of December 31, 2017, based on the COSO criteria. We also have audited, in accordance with the standards of the Public Company Accounting Oversight Board (United States) (“PCAOB”), the consolidated balance sheets of the Company and subsidiaries as of December 31, 2017 and 2016, the related consolidated statements of operations, shareholders’ equity, and cash flows for each of the three years in the period ended December 31, 2017, and the related notes and schedules and our report dated March 1, 2018 expressed an unqualified opinion thereon. The Company’s management is responsible for maintaining effective internal control over financial reporting and for its assessment of the effectiveness of internal control over financial reporting, included in the accompanying “Item 9A, Management’s Report on Internal Control over Financial Reporting”. Our responsibility is to express an opinion on the Company’s internal control over financial reporting based on our audit. We are a public accounting firm registered with the PCAOB and are required to be independent with respect to the Company in accordance with U.S. federal securities laws and the applicable rules and regulations of the Securities and Exchange Commission and the PCAOB.